Republic day in India is celebrated every year by organizing a huge and grand Republic Day parade in New Delhi at Rajpath, India Gate. Republic Day parade is held annually on 26th of January after the Flag hoisting by the Indian President. 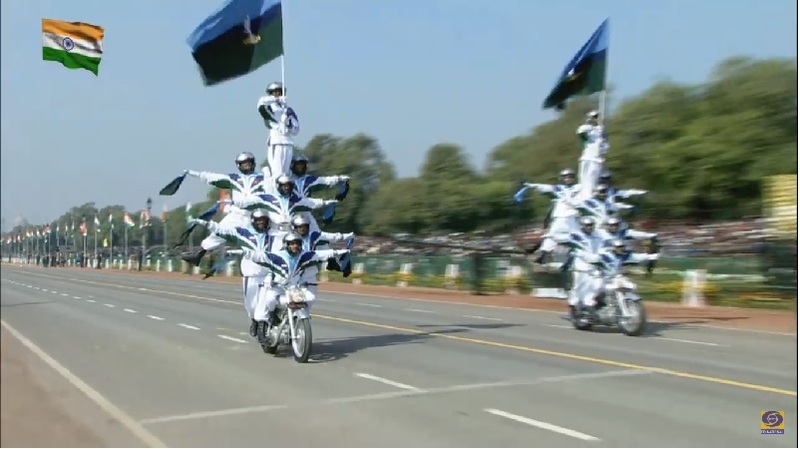 This activity becomes the main attraction of Republic Day Celebration of India which generally extends for next 3 days until the beating retreat ceremony. It is organized by the Indian government to represent the defence capability, cultural and social heritages of India in front of the world. Organizing this event takes much effort from the end of both, the organizer and the participants. 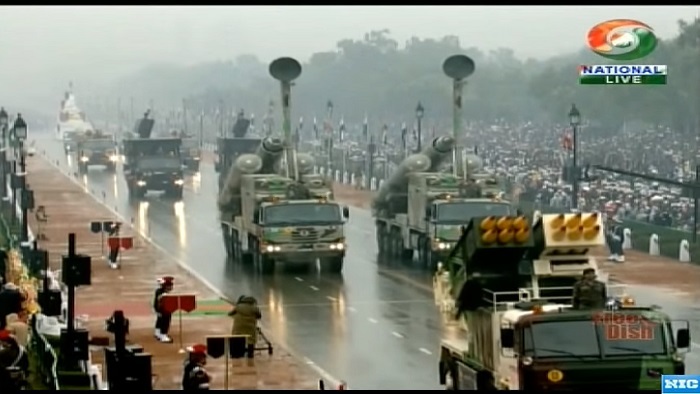 Military parades are held in the national capital as well as various state capitals of the country. Representatives from Army, Navy, Air Force and state wise traditional dance groups of India participate in the Republic Day parade. 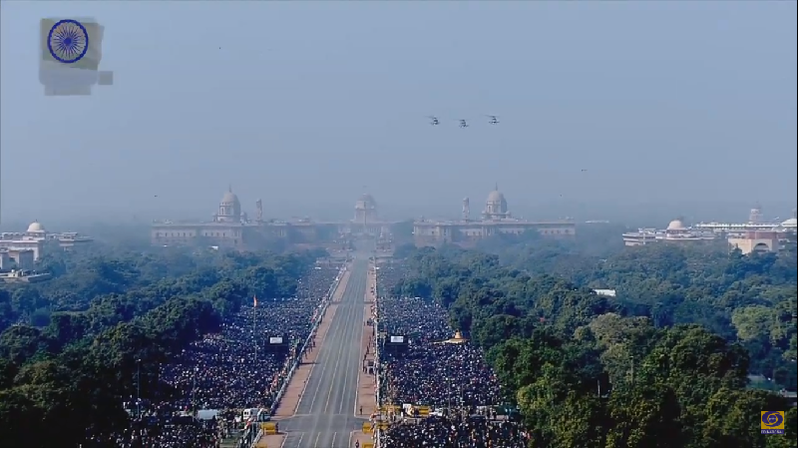 The Republic Day 2019 parade was held this year at Rajpath, New Delhi. 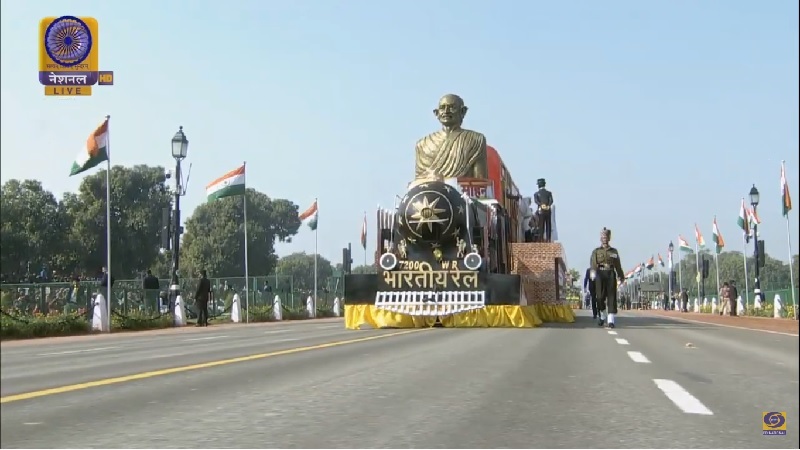 The 2019 parade followed the marvelous history of the Republic Day parade and started after the flag hoisting by the President of India and award distribution ceremony. 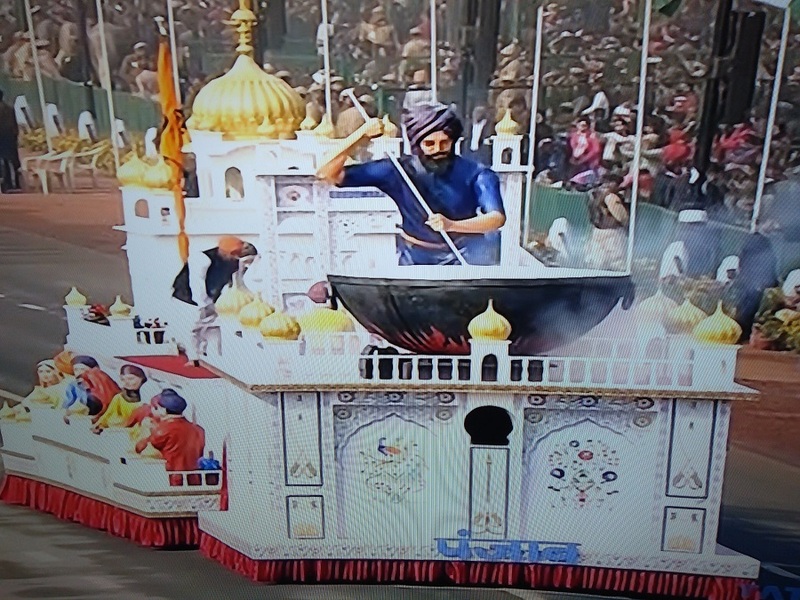 The Republic Day parade timing was from 09:50 AM and continued for 90 minutes. 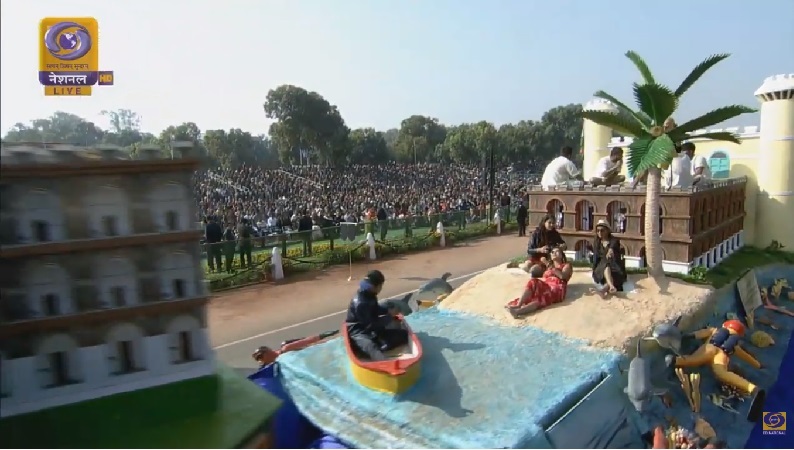 The parade showcased the defense and warfare capabilities of India followed by the portrayal of Indian cultural and traditions through 22 tableaux from various states and ministries. 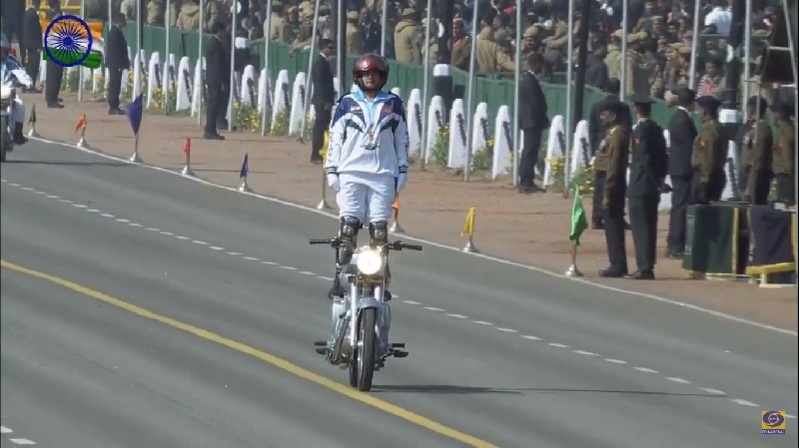 This year, the woman power was seen at Rajpath, when the Army Services Corps (ASC) was first time led by a woman officer and the daredevil team included a woman officer who performed breathtaking stunts in the parade. 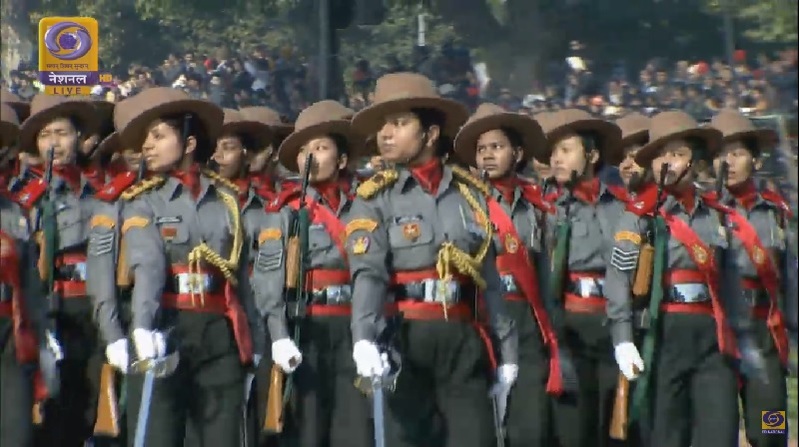 An all women contingent of Assam Rifles debuted in the parade at Rajpath led by Major Khushboo Kanwar. It was first time in the history that a women contingent of Assam Rifles took part in the parade. 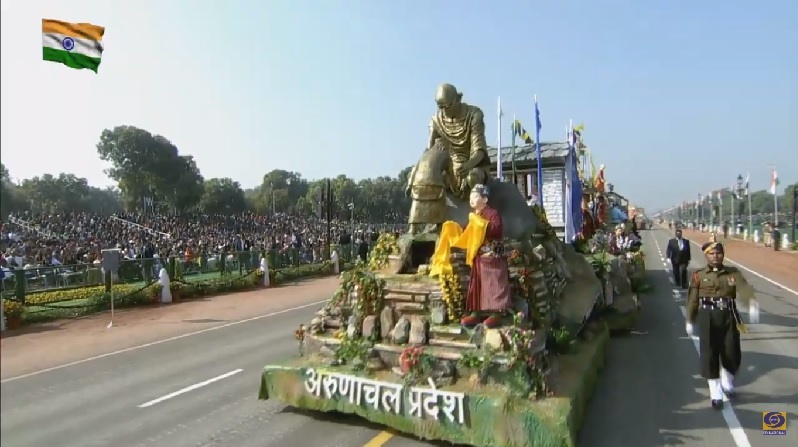 It was first time that 4 veteran soldiers of Netaji Subhas Chandra Bose’s ‘Azad Hind Fauz’ aged above 90 years, participated in this year’s Republic Day parade. 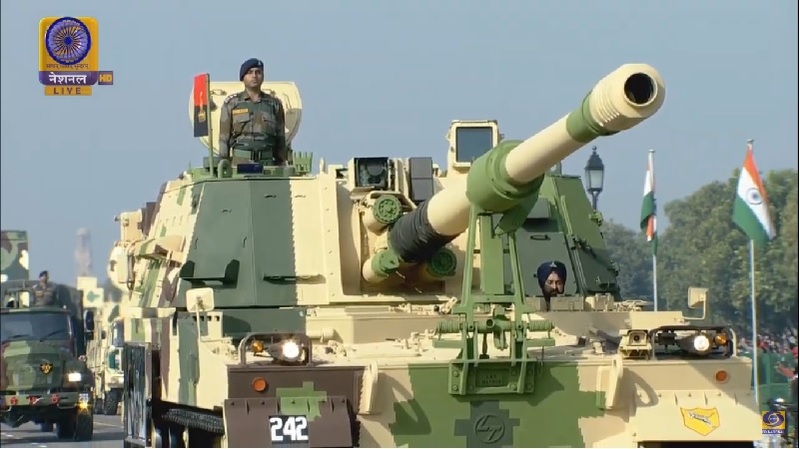 First time Artillery Gun M777 A2 Ultra Light Howitzer and K9 Vajra-T were displayed in the parade. 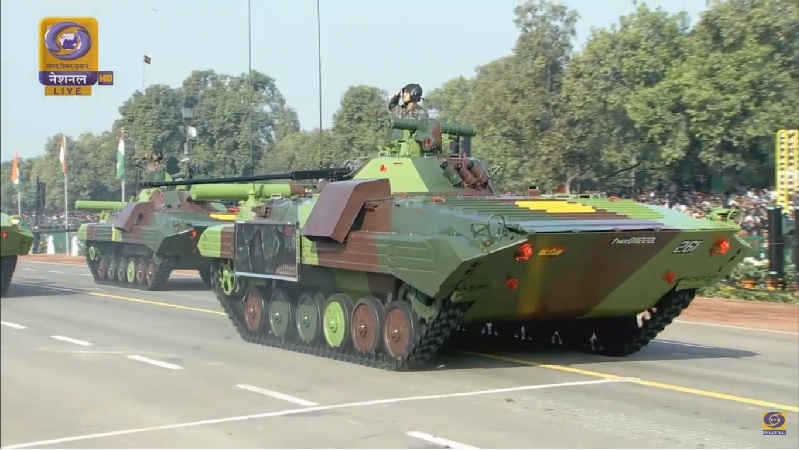 T-90 Tanks, Akash Missile System and Infantry Combat Vehicles were also major attractions at Rajpath. 16 tableau from the states showcased their rich cultural heritage based on ‘Mahatma Gandhi’ theme. 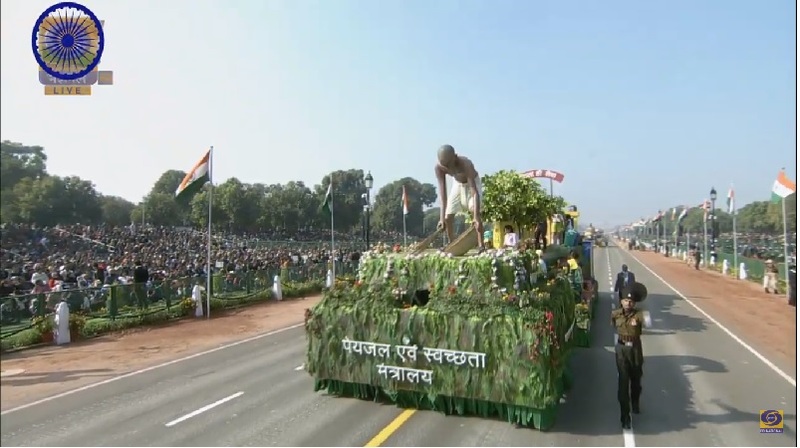 6 tableau from the ministries were based on various schemes and initiative with a theme of ‘Gandhi’. Tripura bagged Best Tableau Award under states whereas Jammu & Kashmir and Punjab came second and third respectively. 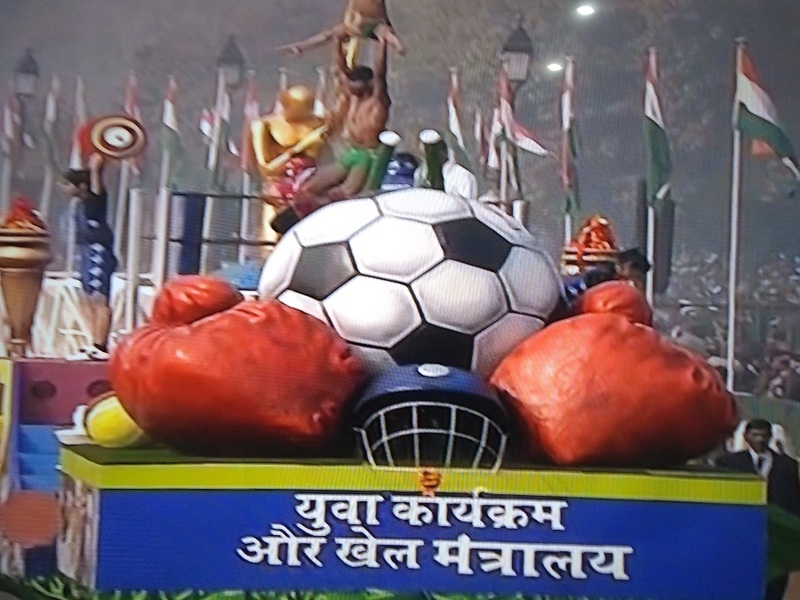 Under the department category, float of CISF which was based on “50 Glorious Years of CISF” and the ICAR tableau which was based on ‘Kisan Gandhi’ jointly shared the award. 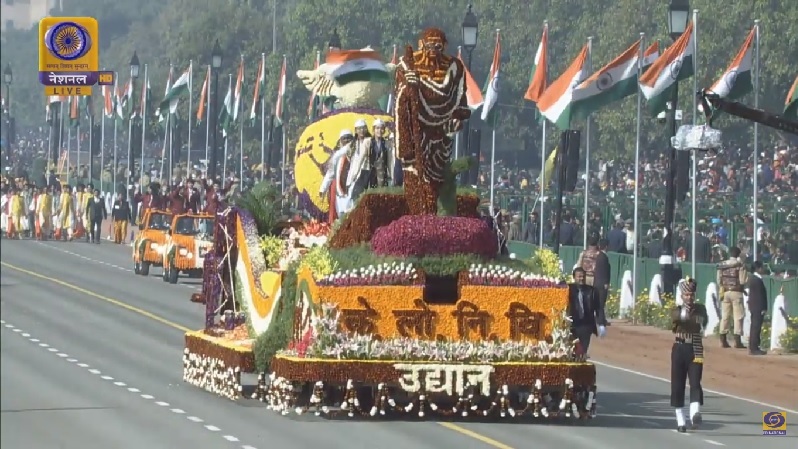 CPWD tableau also got a special award for its outstanding floral decoration representing Mahatma Gandhi. A parade especially held at Republic Day Celebration of India is called as Republic Day Parade. Generally, a parade is a military or public procession held while celebrating a special day or event. We can say that it is assemble of group of people for a formal inspection or ceremonial occasion. It is held in meaningful way to display something while marching or moving around a place or way. A parade is also called as march or marchpast during which a theme based unique representation is carried out by the group of people. Generally, it is organized alongside a street in a particular costume accompanied by the marching bands or floats (a small vehicle or cart especially powered by electricity). A parade can be held for a wide range of reasons however, generally held during celebration of an event or festival. Sometimes, people perform parade during protest demonstrations. 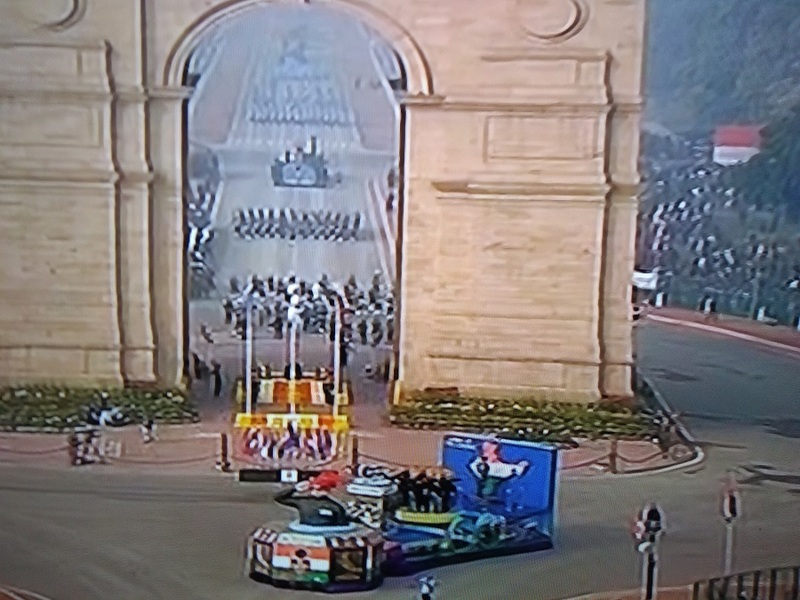 An excellent arrangement is done to demonstrate Republic Day Parade of India at the Rajpath, India Gate. First of all, the president of India unfurls the National Flag of India followed by the National Anthem of India (Jana Gana Mana) is played. 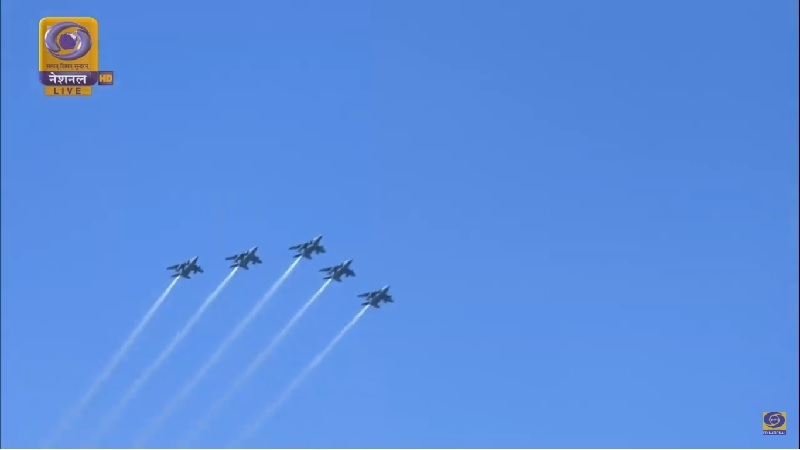 A National Salute is given through 21-gun salute. After this, awards (like the Ashok Chakra, Kirti Chakra, etc) are distributed by the Indian President among people who deserve these awards. Then the bravery awards and medals are distributed by the President among people (from armed forces and civilians) for their exceptional courage and different acts of valor in difficult situations respectively. 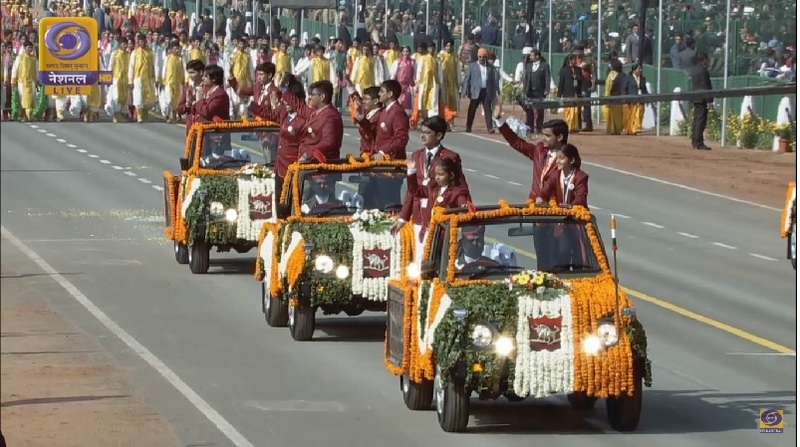 Some children (who receive National Bravery Award) also take part in the parade during which they ride in front of the spectators on some colorfully decorated elephants or vehicles. 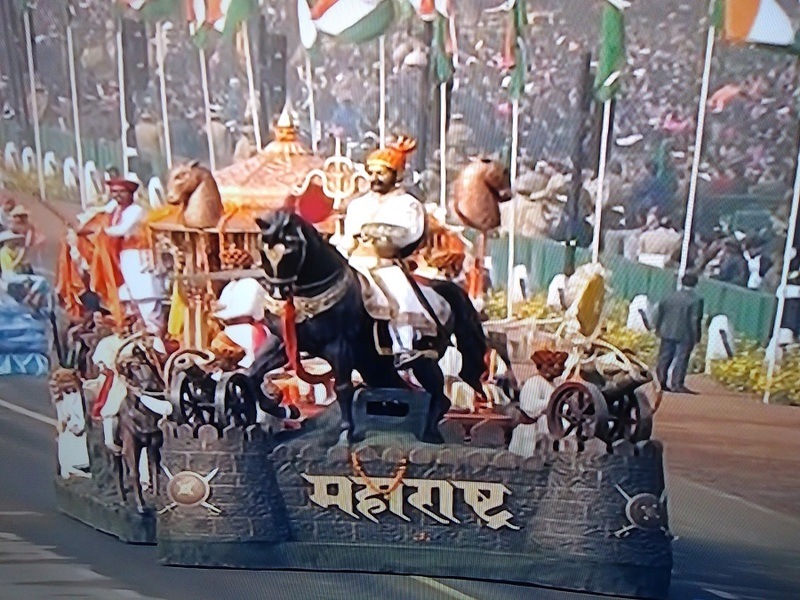 The Republic Day parade of India is one of the famous parades of the world having more than 25 marching and mounted contingents, around 20 military bands, various military vehicles, 30 cultural tableaux, approximately 30 aircrafts, state wise cultural performers, 1200 school children, etc. Variety of regiments from the Indian Army, Navy, and Air Force with their different bands and official decorations take part in the march past. Commander-in-Chief of Indian Armed Forces becomes the President of India who takes the salute. 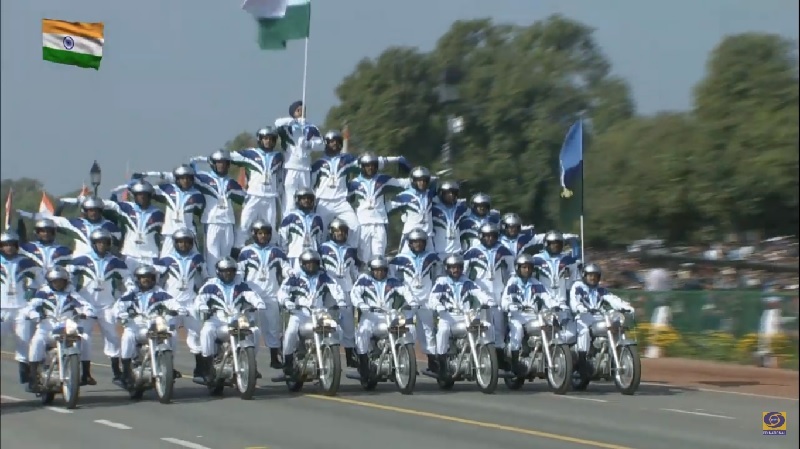 Various para-military forces and other civil forces of India participate very actively in the republic day parade. 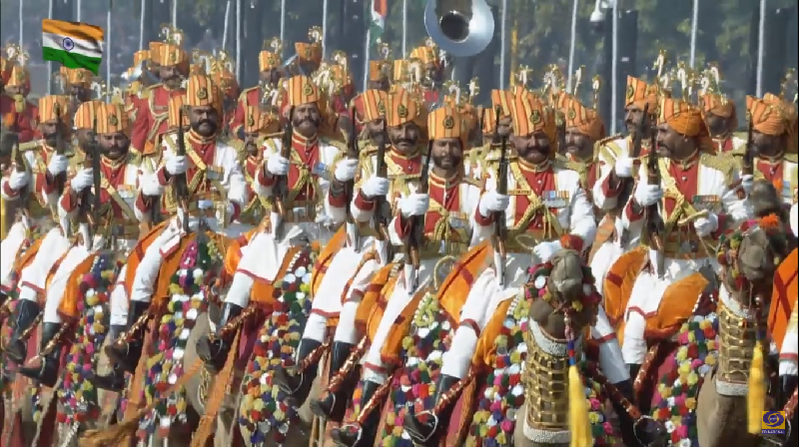 The whole sight of parade becomes very attractive and entertaining especially because of the camel mounted Border Security Force contingent (the only camel mounted military force in the world). 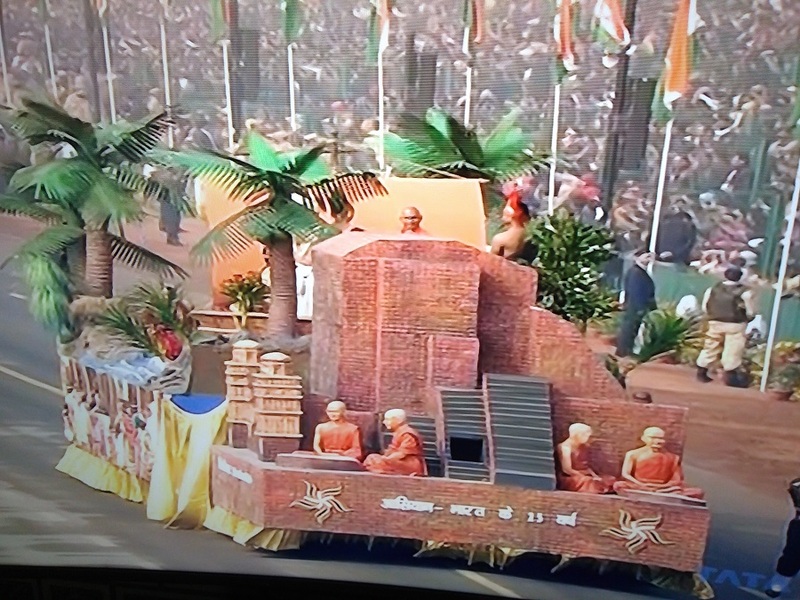 Other participants of republic day parade are N.C.C. cadets (especially selected for parade from all over the country) and school children (from various schools all across the country). Various small vehicles or carts especially powered by the electricity (also called floats, 22 to 30 in number) take part in the parade of Indian republic day to demonstrate the cultures of various states and union territories of India. 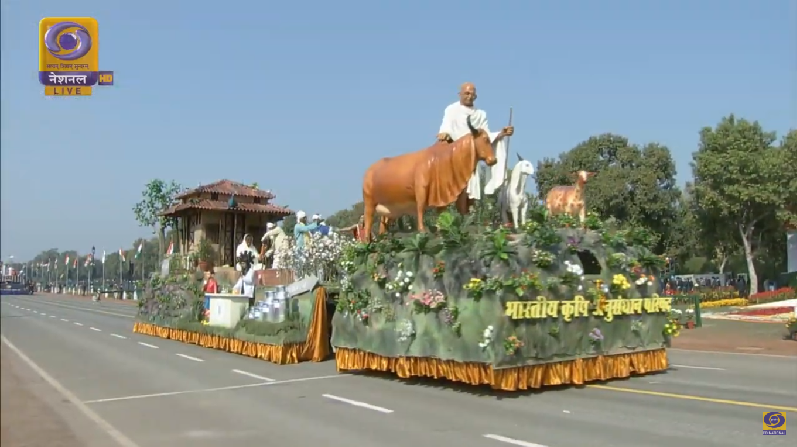 Such floats of the union ministries and state enterprises give a grand look to the parade. 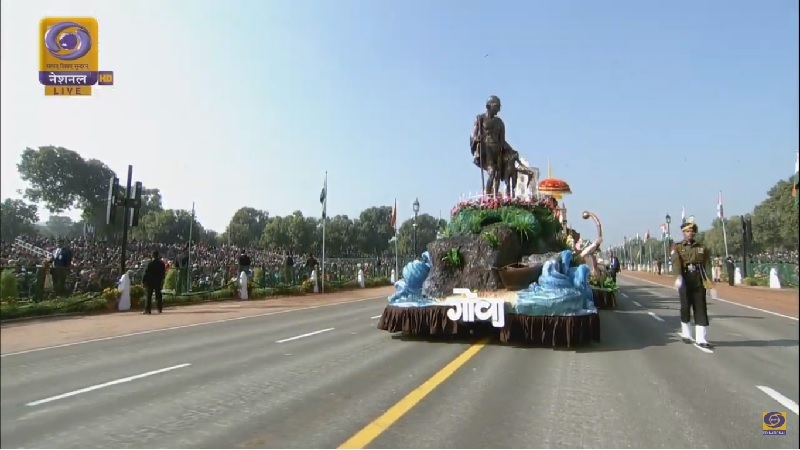 The annual parade of Indian Republic Day is broadcasted live all through the nation on television and radio. 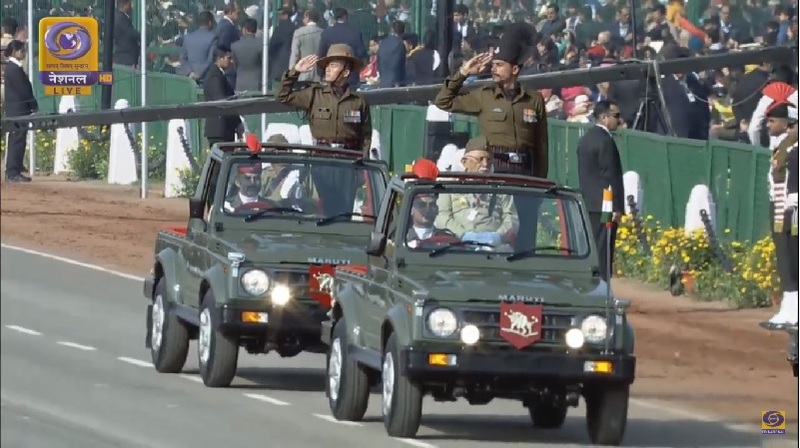 This parade shows the power of Indian army and military, tradition and culture of all the Indian states, special activities of government, music, dance and songs by school students, etc. 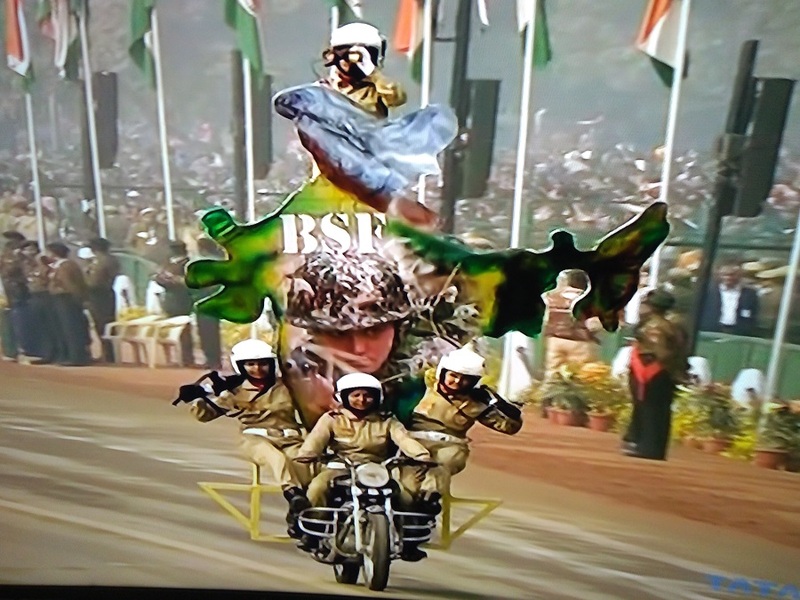 Motorcycle units of the Armed Forces demonstrate their dare devil motor cycle riding followed by the attractive flypast (flying parade in fighter planes) performed by the Air Force jets and helicopters carrying the national flag. 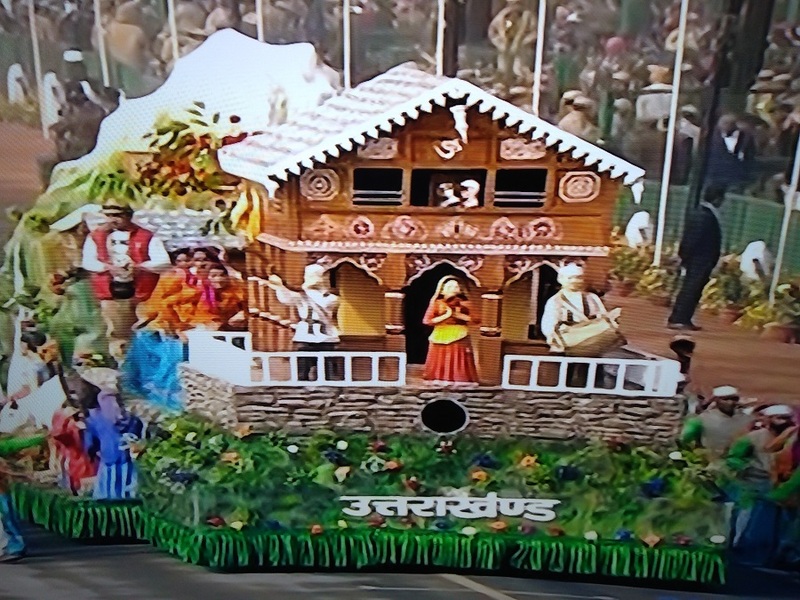 Each display of the parade demonstrates the unity in diversity among people of different religions and richness of Indian culture in heritages and festivals. In this annual parade, around 1200 school children take part to show cultural dances and songs. All the participants consider their honor to be participated in this great national event. The first Indian Republic Day parade was performed in 1950 when the first republic day of India was celebrated. 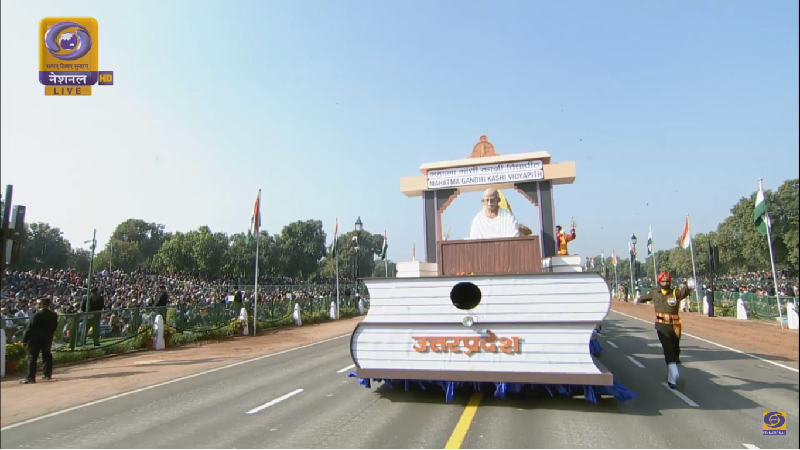 Parade starts after the arrival of President of India. 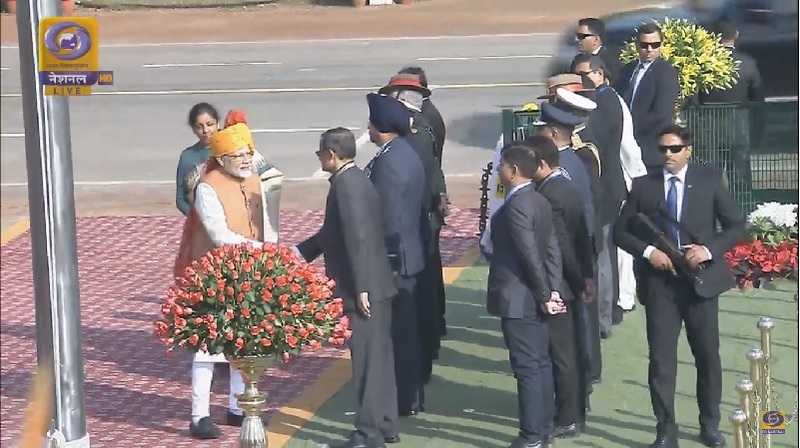 Before the parade, Prime Minister of India pays a tribute to the sacrificed Indian soldiers by laying a wreath at the Amar Jawan Jyoti at India Gate. And, the President of India unfurls the National flag. 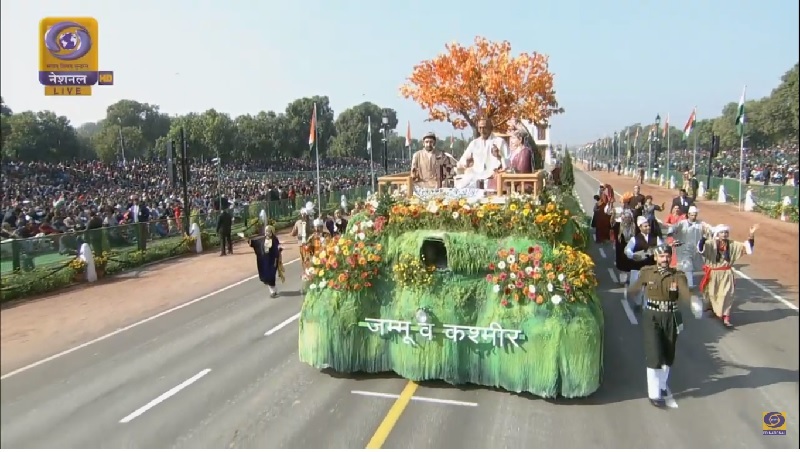 Republic Day parade of India is held in the national capital, New Delhi. 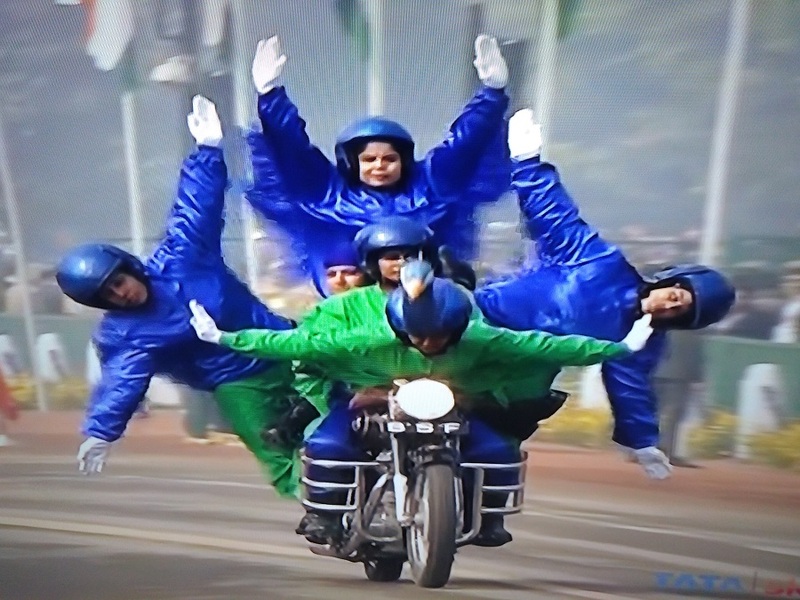 It is performed at Rajpath, India Gate. It starts from the Raisina Hill near to the Rashtrapati Bhavan (residence of Indian President) and ends at India Gate. 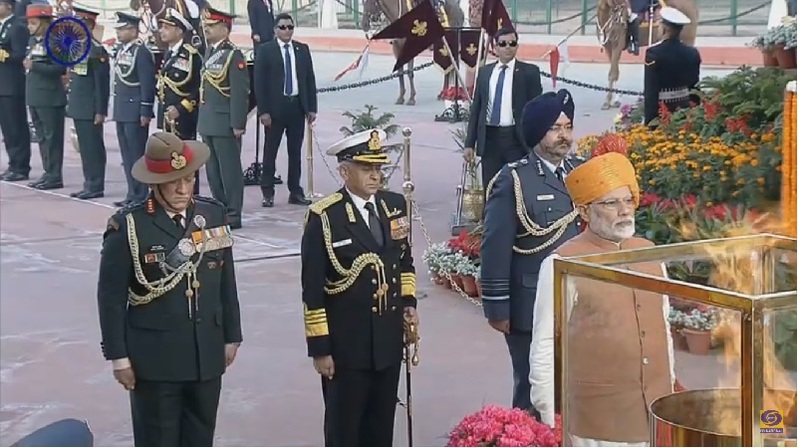 Prior to the parade, a floral tribute is given at the Amar Jawan Jyoti by the PM with two minutes silence in the memory of martyred soldiers (during freedom movement and succeeding wars of defence of country) as well as National Flag is unfurled by the Indian President. 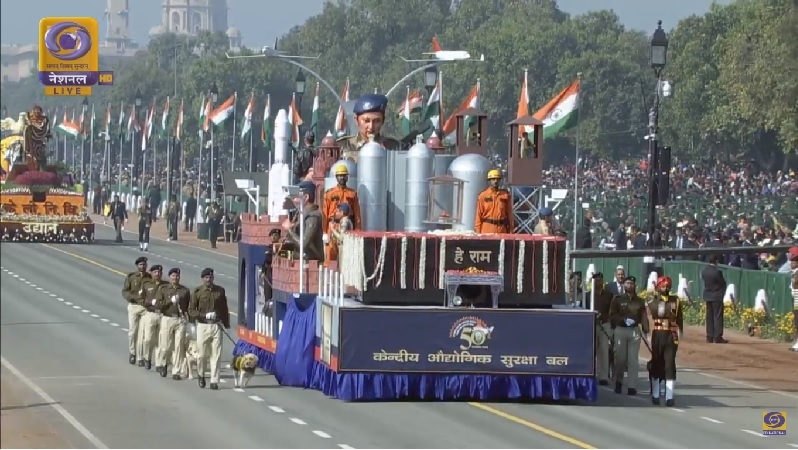 The route of republic day parade is more than five kilometers long. Generally, it is performed at 9.30 a.m. in the morning after flag hoisting at 9.00 a.m. on 26th of January every year. 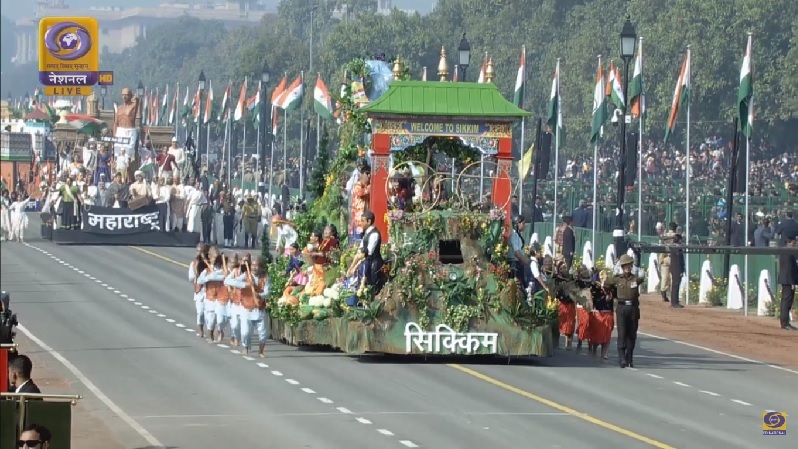 The total timing of republic day parade becomes around three hours long. Few days before the actual performance on 26 January, participants start rehearsing on the way. May be the timing of parade reduced to 90-minute only instead of usual two to three hours. According to the government plans, the number of marching contingents can be cut down by adding some of them together. 07th Jan. to 25th Jan. In order to attend the republic day parade very peacefully and easily, one needs to follow all the rules and regulations made by the security there. 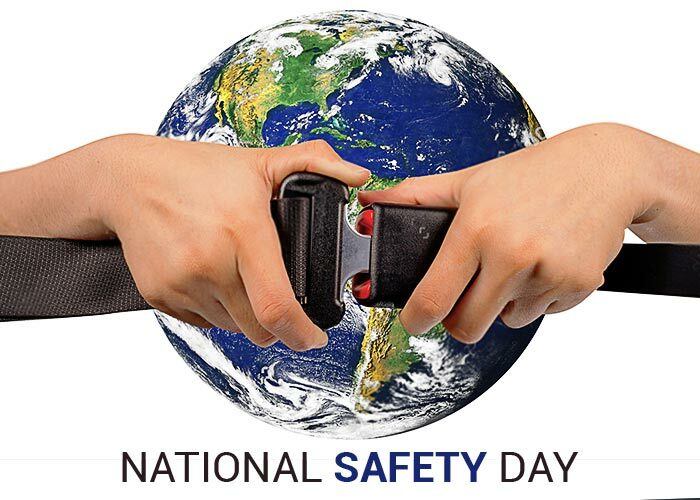 You are not allowed to carry your mobile phones, camera, laptop, digital diary, transistor, remote controlled car-keys or any other electronic devices for security reasons. You need to drop all the electronic devices at your home or submit it at the security check point available there. People having their own vehicle need to display Parking Sticker in front of the vehicle otherwise they will be prohibited to enter the high-security zone. Once parade starts, entry becomes prohibited and no one can enter the venue. Taking water bottles, beverages or other eatable things are not allowed. You need to be sure to have your ticket while entering to the venue. 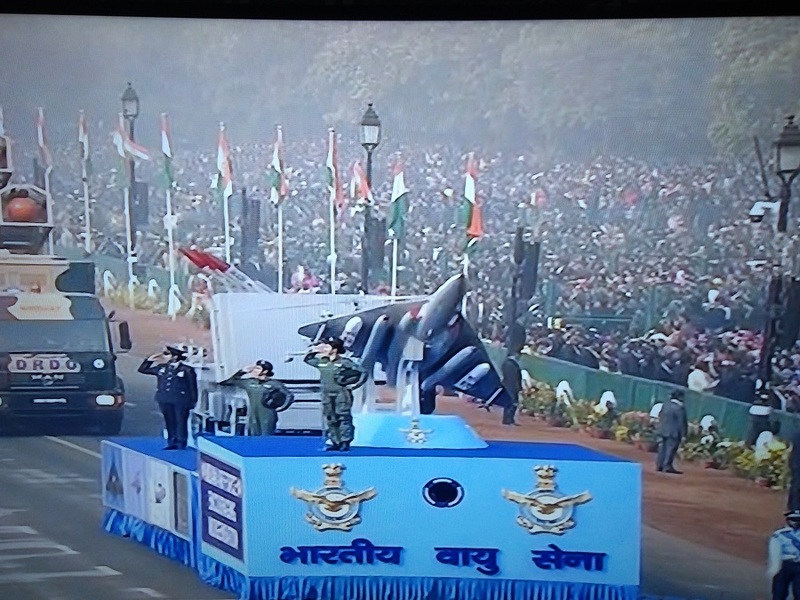 Republic day parade is organized by the Ministry of Defence. Organizing national functions (such as Republic Day Parade, Beating Retreat Ceremony, Independence Day Flag Hoisting Ceremony, Martyrs’ Day, etc) is the primary responsibility of Ministry of Defence. Preparations for republic day parade start few weeks ago of the main date of celebration. Participants of republic day parade have to come at the India Gate to do rehearsal on the Rajpath for the final celebration. Indian soldiers start rehearsing in the early morning for the upcoming republic day parade in New Delhi. Sitting arrangements and other preparations starts at least two weeks ago. 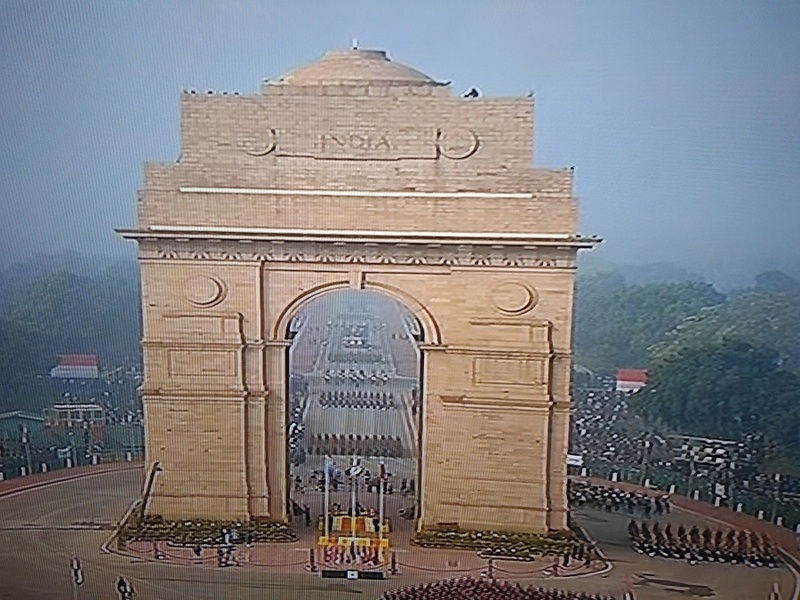 Security becomes tight and entry of public gets prohibited at the India Gate for safety reasons on 26 January. Legal checking by police starts all through the national capital few weeks ago in order to protect the terrorist attack at this event as it attracts a huge crowd in the city. 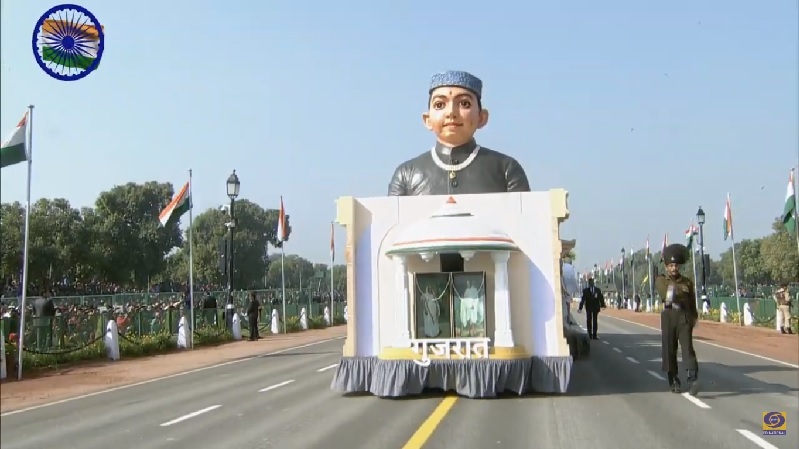 A grand republic day parade is held on 26 January to mark the importance of this occasion. It is held especially in the national capital, New Delhi in front of the Ama Jawan Jyoti to pay tribute and honor to the India soldiers for their sacrifices during freedom movement and war to protect the nation. It starts from the Raisina Rashtrapati Bhavan along to the Rajpath and ends at past India Gate. 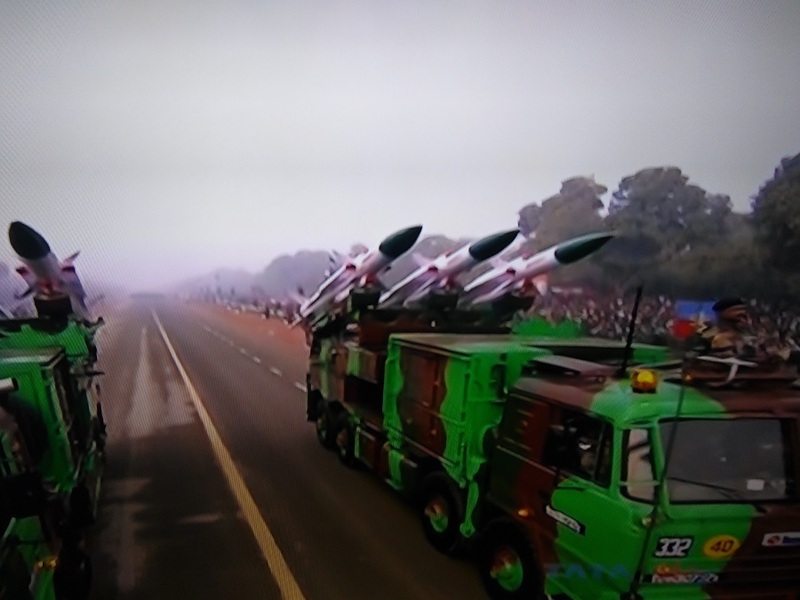 This parade is very significant as it represents the power of Indian armed forced (by showing tanks, missiles, radars, etc), culture and tradition of different Indian states and creativity of school students. 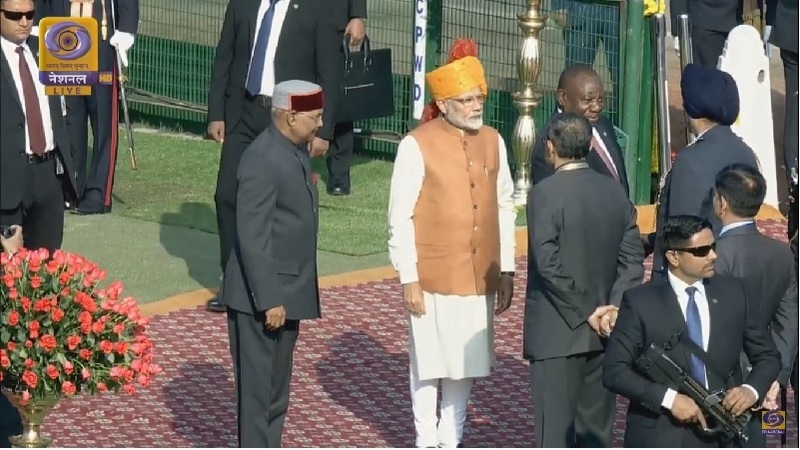 Invited chief guest (from another country) and President of India becomes the guest of honor of the republic day parade. Floral tribute at the Amar Jawan Jyoti, flag hoisting, 21 gun salute and play of National Anthem mark the beginning of parade. 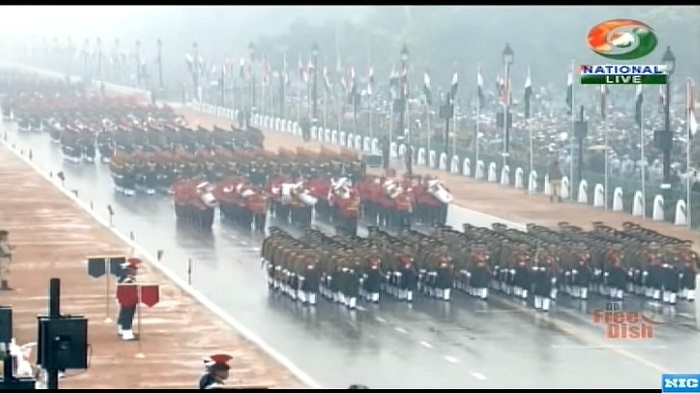 President of India (the Commander-in-Chief of Indian Armed Forces) takes the salute of this grand parade. It gives courage to the Indian youths and makes them feel proud to be an Indian citizen. 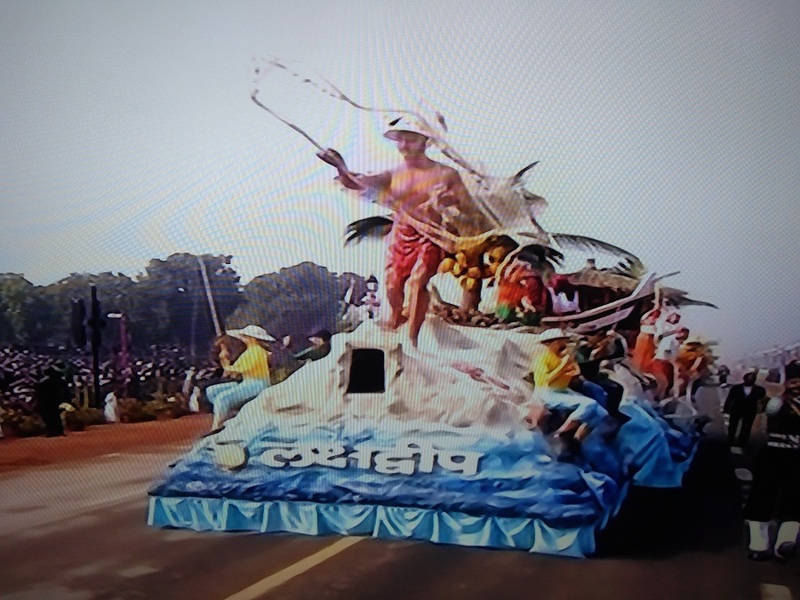 A grand republic day parade was held in Mumbai at Marine Drive (in 2014) or Shivaji Park in central Mumbai (in 2015). A parade and cultural fair is organized in Bangalore on 26 January at the Field Marshal Manekshaw Parade Ground. In Kolkata, it is organized along the Red Road near the Maidan. In Chennai, the most common venues are Kamaraj Salai and Marina Beach. 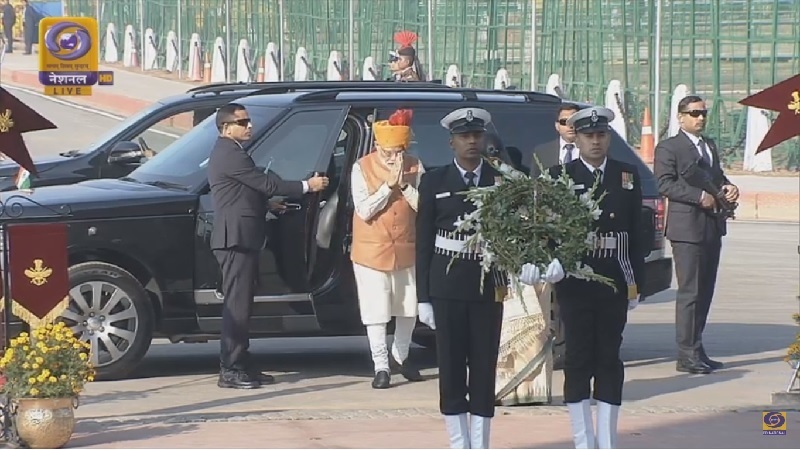 Arrival of Prime Minister Narendra Modi at Amar Jawan Jyoti. 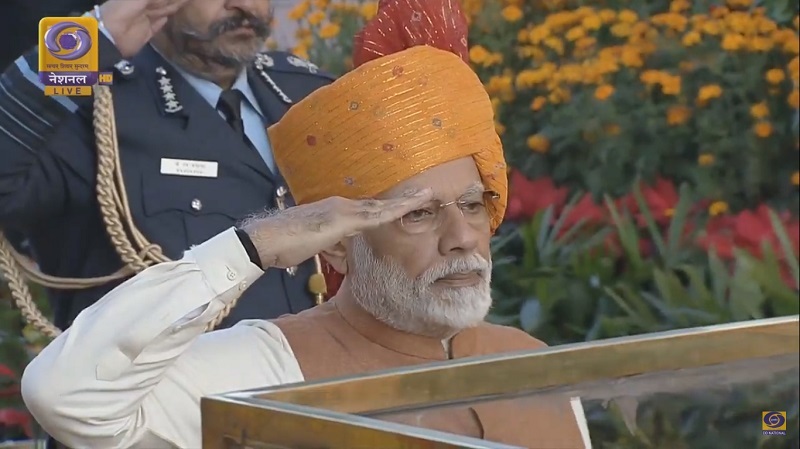 Prime Minister Narendra Modi pays floral tribute and salutes the brave soldiers at the Amar Jawan Jyoti. The three heads of Indian Armed Forces saluting at Amar Jawan Jyoti. 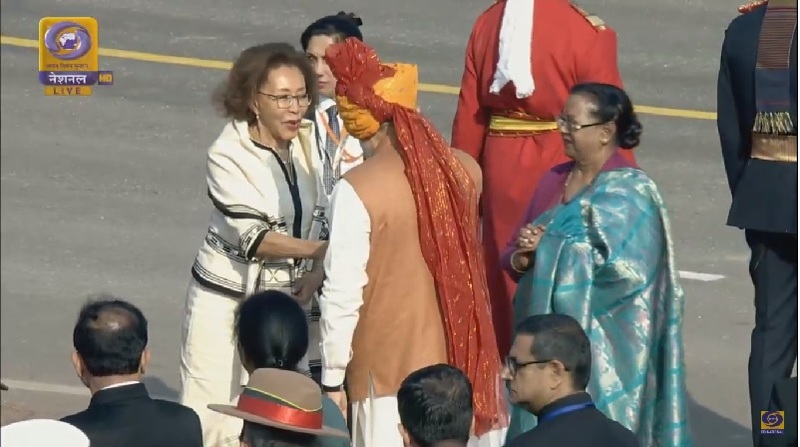 Prime Minister arrives at the Rajpath and is greeted by the dignitaries. 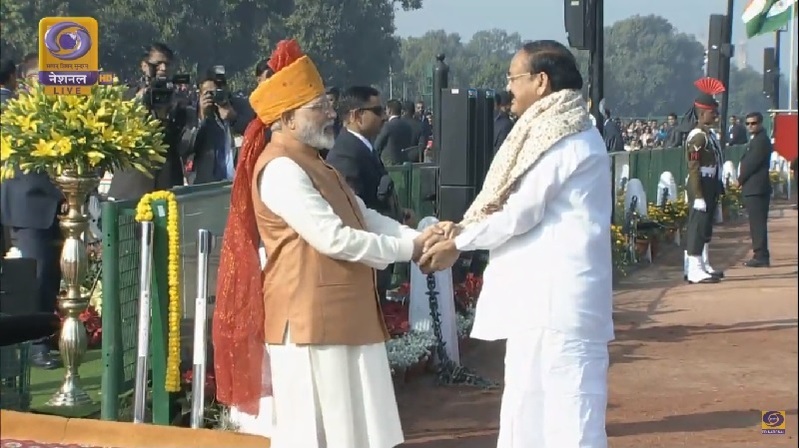 Vice President Sri Venkaiah Naidu arrives at Rajpath and is greeted by the Prime Minister. 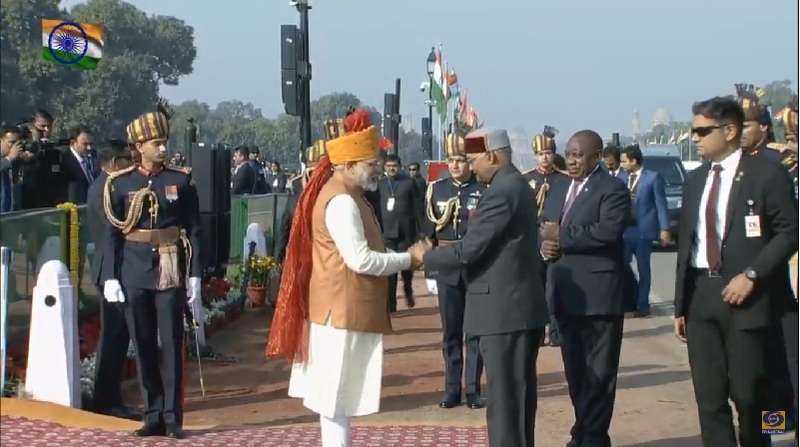 President of India Sri Ram Nath Kovind arrives at Rajpath with the Chief Guest of the 70th Republic Day Mr. Cyril Ramaphosa and is greeted warmly by Prime Minister Narendra Modi. Prime Minister introduces the Chief Guest to the three heads of the Indian Armed Forces. Flag is hoisted and National Anthem is sung at Rajpath. 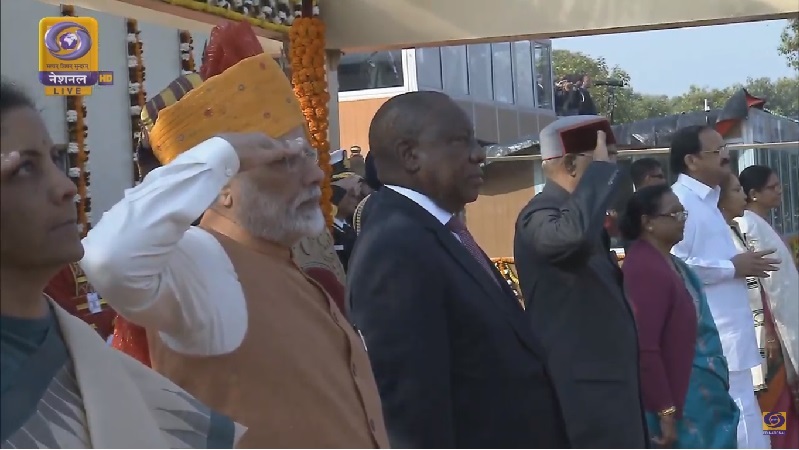 President, Prime Minister along with the other dignitaries salutes the National Flag. 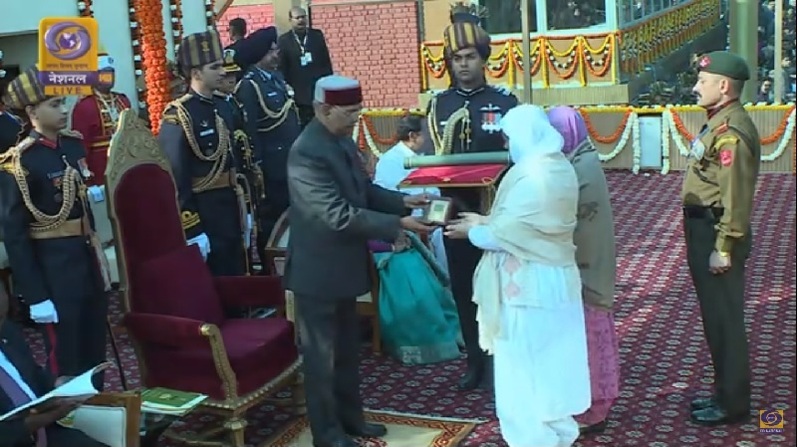 President awarding the Ashok Chakra to wife of Lance Naik Nazir Wani posthumously for his great sacrifices for the nation. 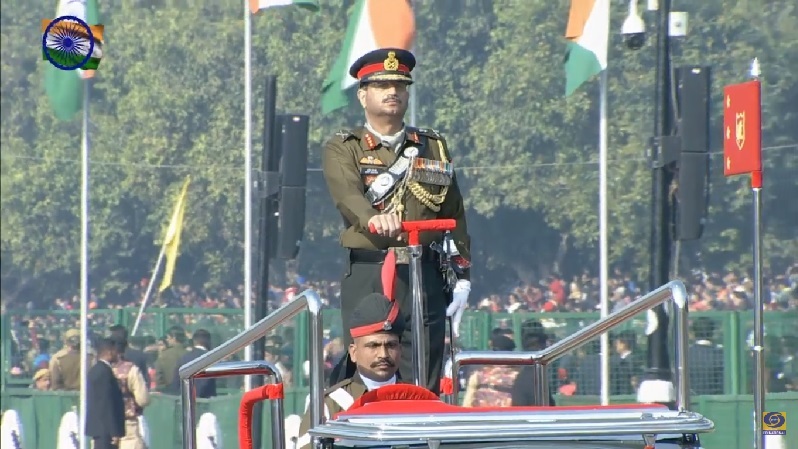 The parade gets started at Rajpath lead by Lt. General Asid Mistry. 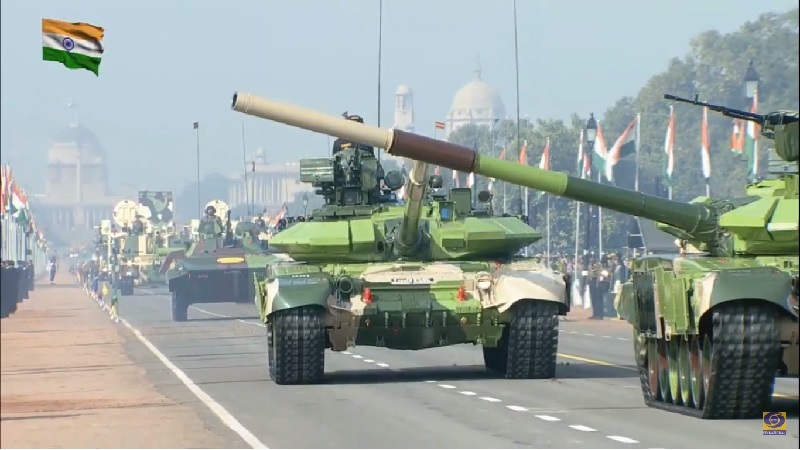 T-90 Bhishma Tank arrived in the parade starting to showcase the military might of the country. Following the T-90 Tank, arrives the Infantry Combat Vehicle in the parade. 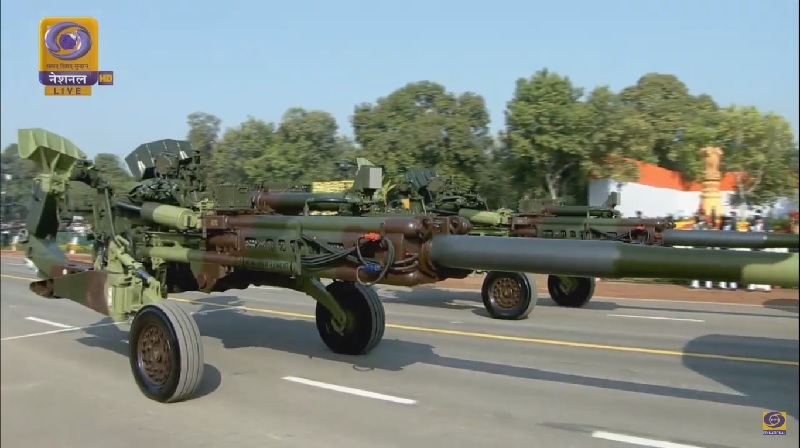 K9-Vajra-T Gun arrives at Rajpath which is the first time being displayed in the parade 2019. Now comes the M777 Howitzer which has been recently inducted in the Indian Armed Forces. 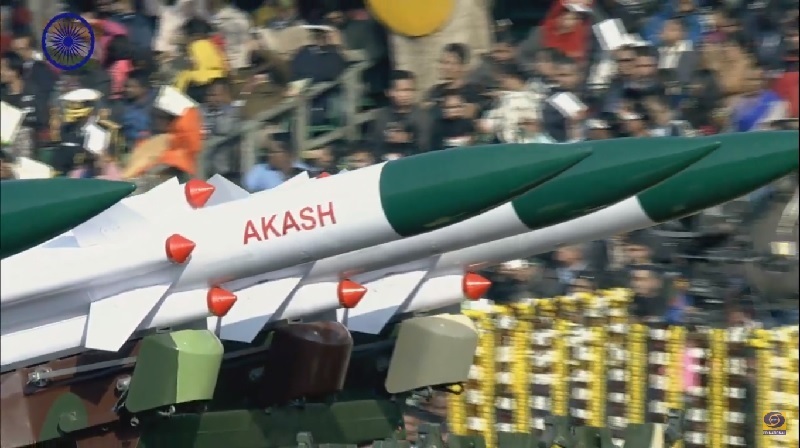 The Mobile Surface to Air Missile Aakash showcased in the parade. Bhawana Kasturi, the first women officer leading the all men contingents of the Armed Forces. 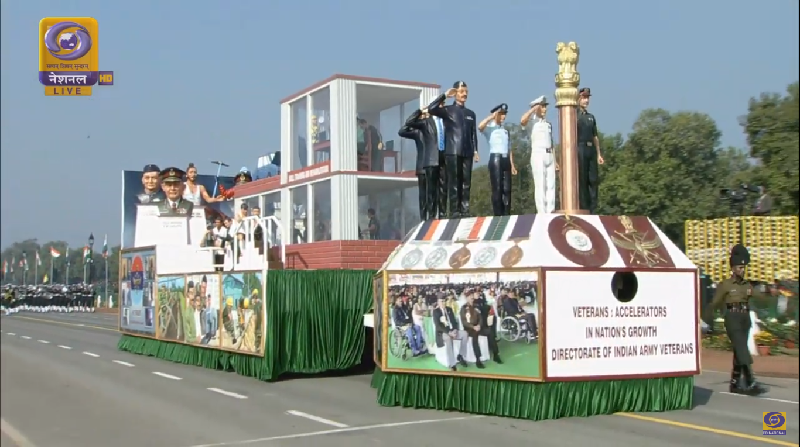 The Directorate of Indian Army Veteran tableau following the army parade is based on the theme to pay tribute to the veteran soldiers of the Indian Armed Forces. 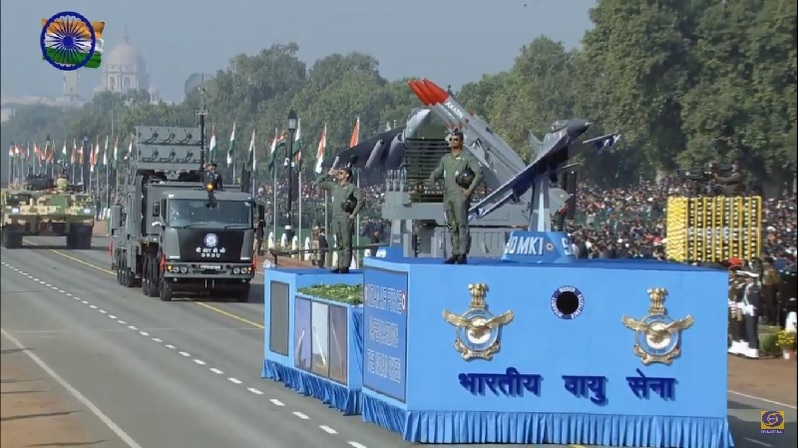 The tableau of the Indian Air Force showcases the defense capabilities of the Indian Air Forces depicting Aakash Missile System and fighter Aircrafts. It is the first time that four veteran soldiers of the Netaji’s Azad Hind Fauz took part in the Republic Day Parade. 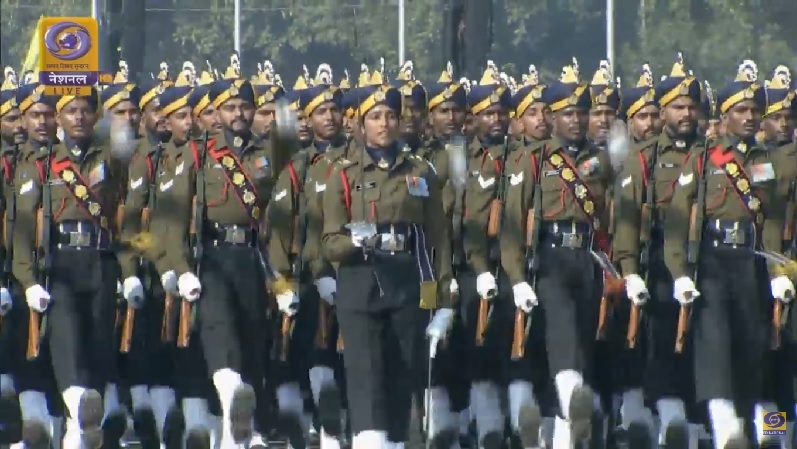 An all women contingent of Assam Rifles arrives at Rajpath which is the first time in the history of Republic DAy Parade. The well decorated Camel Mounted contingents of the BSF follows the parade at Rajpath showcasing the rich history of their courage. 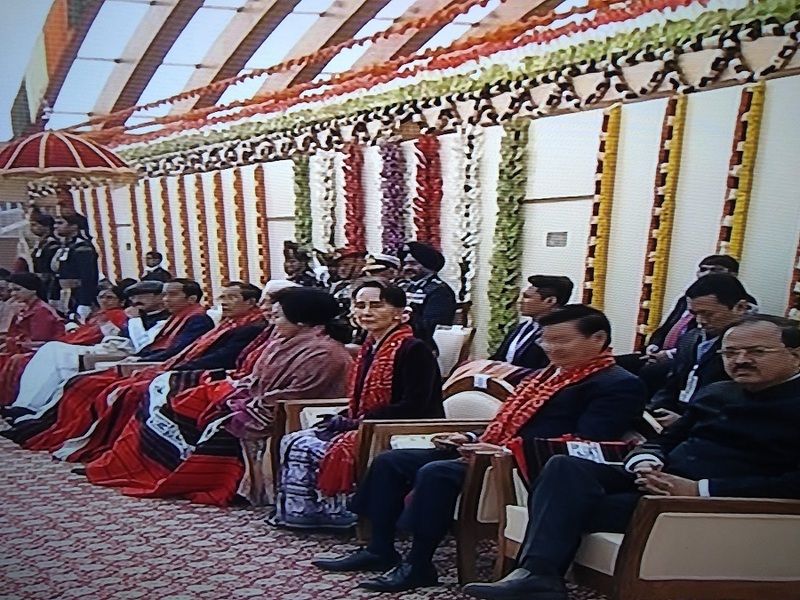 The Sikkim tableau displayed the non-violence, prosperity and happiness of the state. The Andaman & Nicobar Tableau displayed the effect of Gandhi to the inmates of the Cellular Jail. 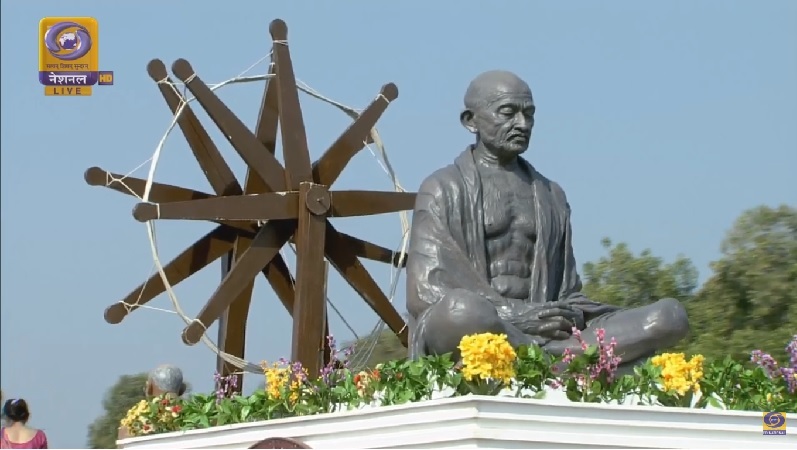 The Assam Tableau was based on the topic ‘Gandhi Ji in Assam’ and how he helped in spreading the importance of non-violence and unity in the state. 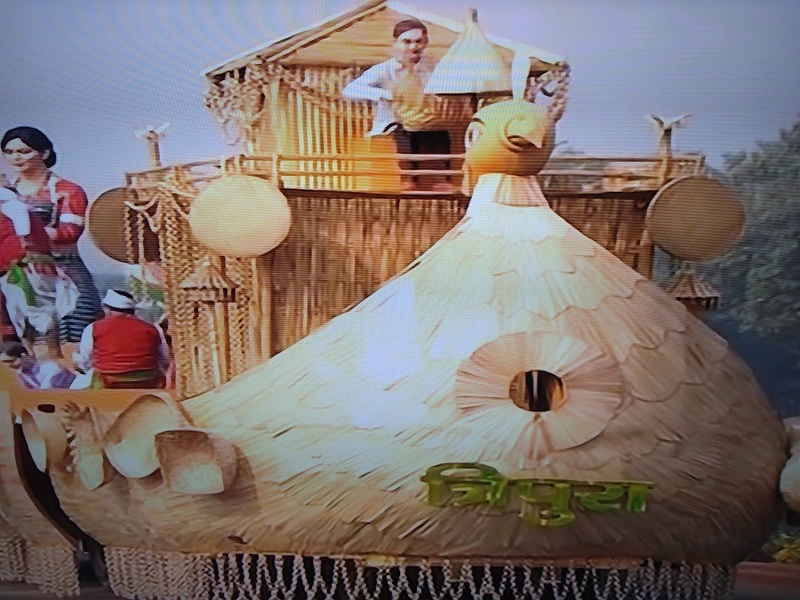 The Tripura tableau was based on the theme of “Rural Economic Development through the Gandhi Ji’ Ideologies”. 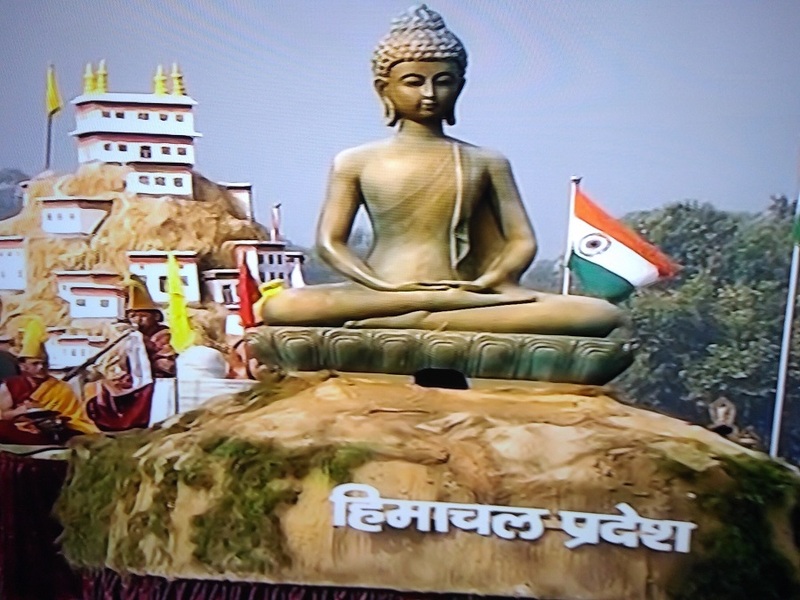 The Goa Tableau exhibited the theme of ‘Place where Peace still prevails’ and ‘Sarva Dharma Sambhav’. 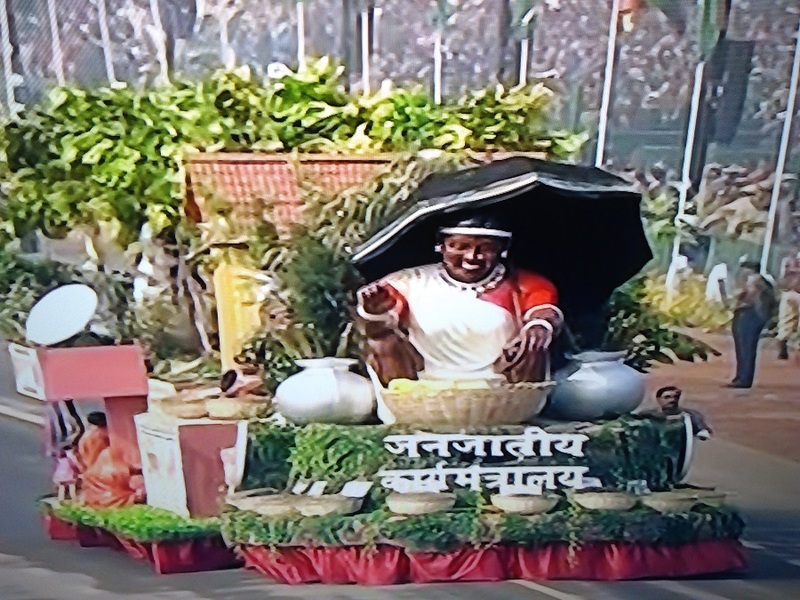 The tableau from Arunchal Pradesh was based on the theme “Peace Within” and depicted that “Cleanliness is next to Godliness”. The Punjab tableau showcased the Jalliawalan Bagh Massacre where hundreds of people were killed during a peace protest. 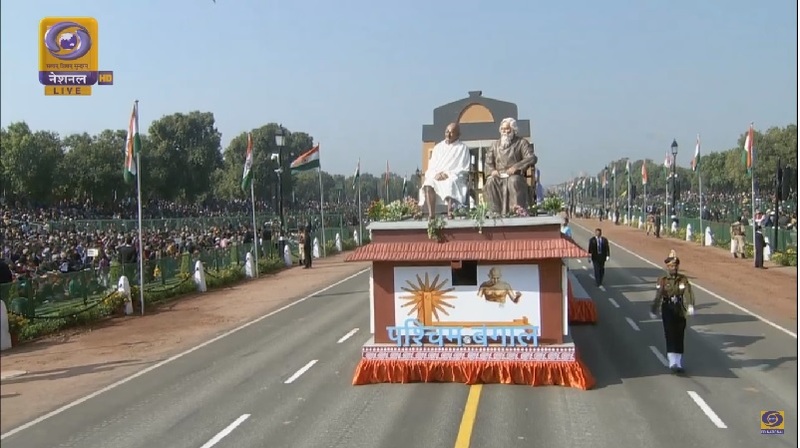 The Tamil Nadu Tableau was based on the visit of Mahatma Gandhi in Tamil Nadu and meeting the peasants in Madurai. 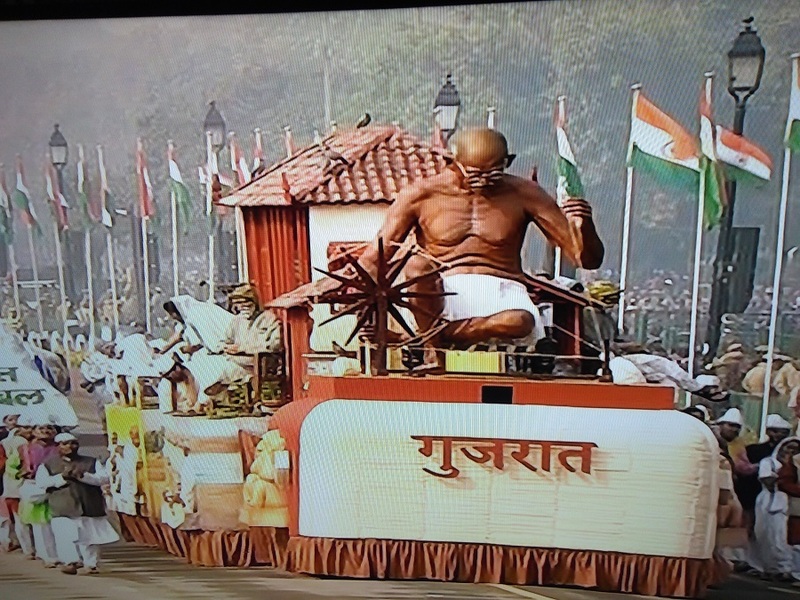 The tableau from Gujarat was based on the historical ‘Dandi Yatra’ of Mahatma Gandhi which shook the foundation of the British Rule in India. 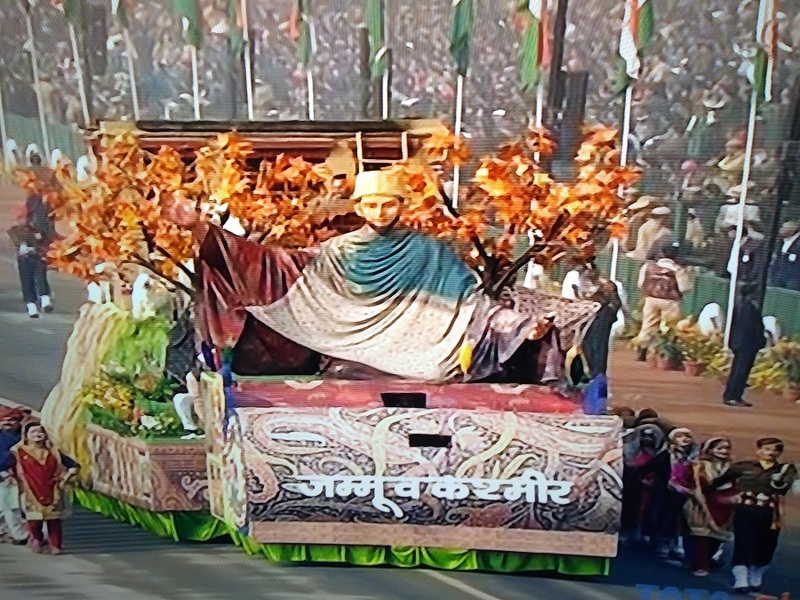 The Jammu & Kashmir tableau was based on the theme ‘Gandhi Ji’s – A Ray of Hope A Composite Culture. The Karnataka tableau depicted ‘Gandhi ji in the Belagavi Congress Session’. 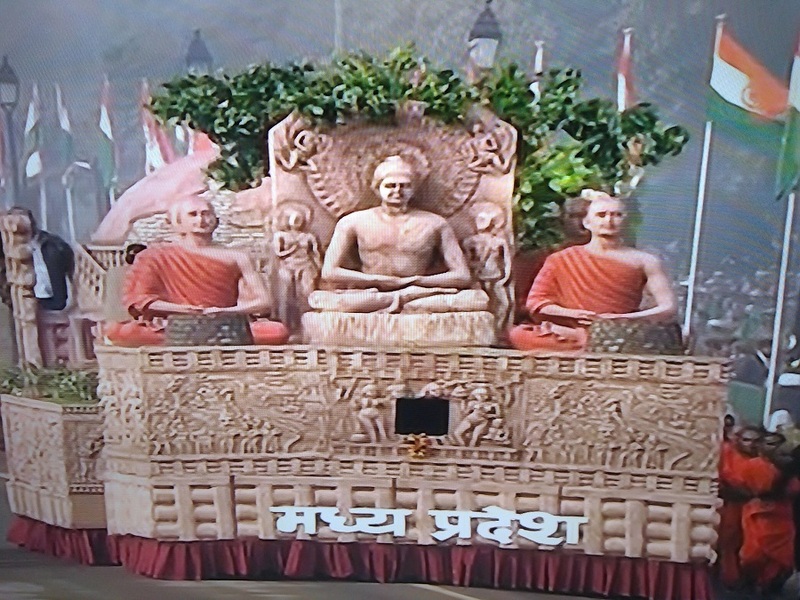 The Uttrakhand Tableau showcased the Mahatma Gandhi’s Kosani’s Anashakti Ashram in Uttrakhand. The tableau of Delhi depicted the long stay of Mahatma Gandhi in New Delhi in the Birla House. 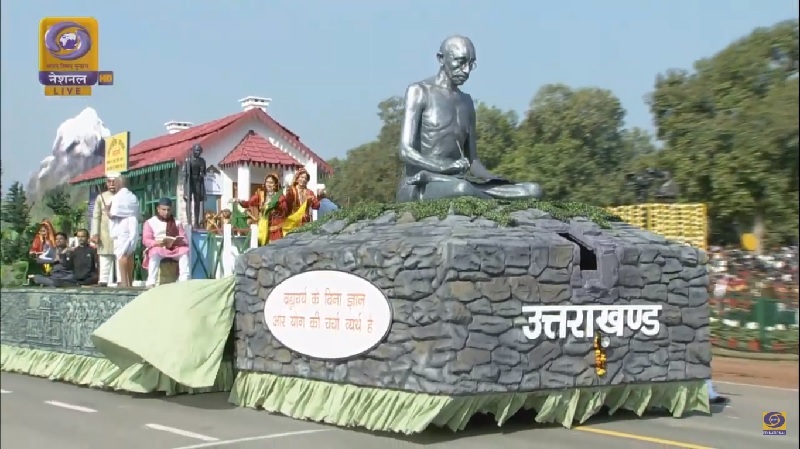 Uttrar Pradesh Tableau showcased the historical institution ‘Mahatma Gandhi Kashi Vidyapeeth’ and depicts how Gandhiji believed that education is important for the all round development. The West Bengal tableau was based on the stay of Mahatma Gandhi during the freedom struggle and his closeness with Rabindranath Tagore. The energy ministry tableau showcased the electrification of rural areas and use of non-conventional sources of energy. 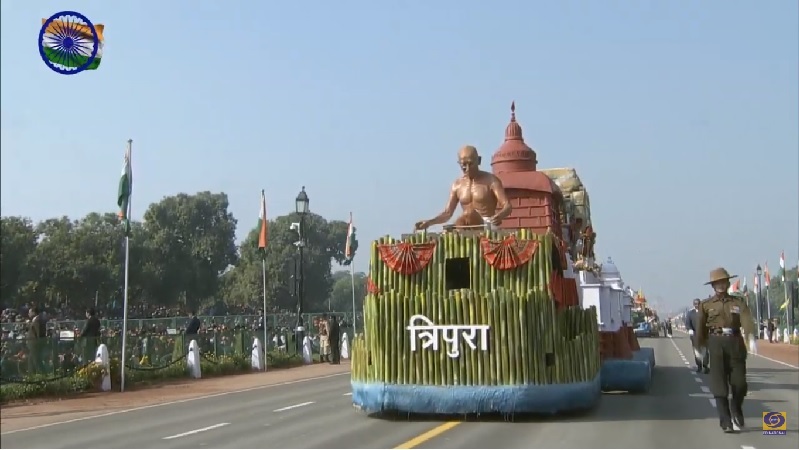 The Water and Sanitation Ministry depicted the Swachh Bharat Mission through its tableau at Rajpath. The Railway Ministry depicted the importance of Railway in Gandhi Ji’s life and his transformation from Mohan to Mahatma. The Tableau of CISF showcased the celebration of its glorious 50 years of service. 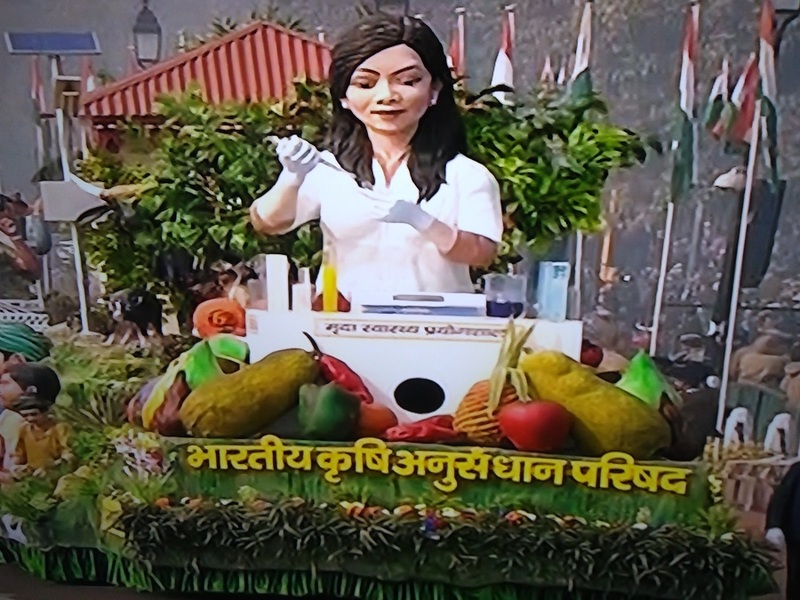 The Horticulture department of CPWD depicted the celebration of 150th birth anniversary of Mahatma Gandhi through its tableau. The children who won the bravery awards were also participated in the parade with great pride. 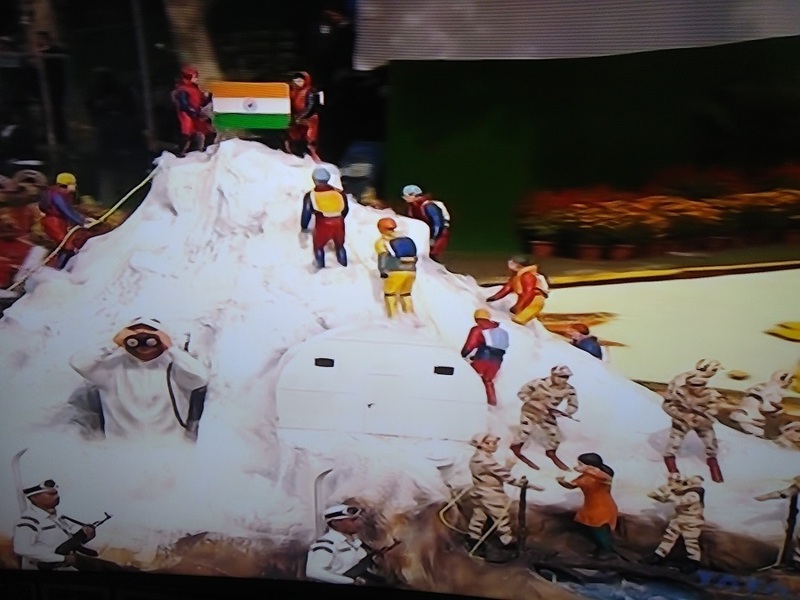 Stunts performances were also carried out at Rajpath by the brave hearts of the Indian forces and it was lead by the Captain Shikha Surabhi. The magnificient stunt performances by them was highly applauded by the audiences. 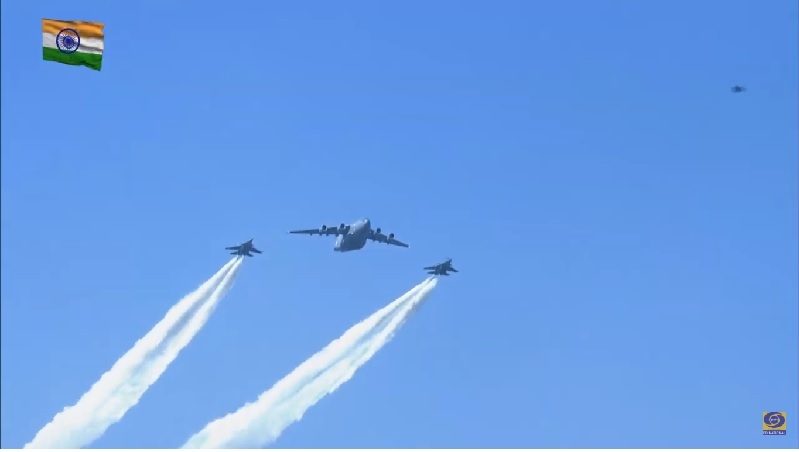 The crowd also witnessed the spectacular flypast by the fighter jets and helicopters of the Indian Air Force in various formations. 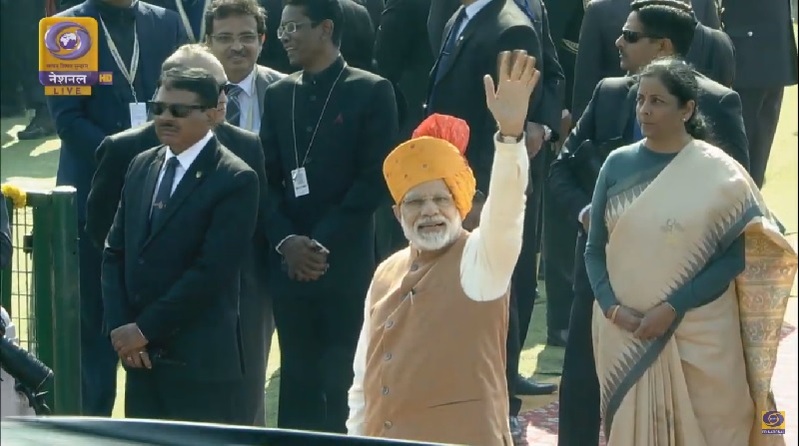 Prime Minister Narendra Modi waved hand and greeted the visitors and audiences of the Republic Day celebration after the conclusion of the parade. 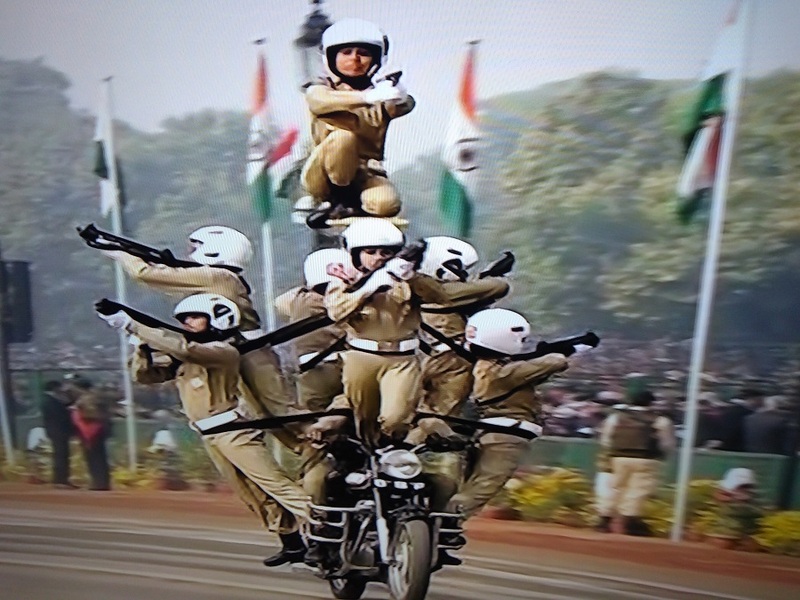 Indian Women BSF – It is for the first time that Indian women BSF are doing stunt at Rajpath on republic day 2018. Debut of women’s contingent from Indian army (all three services) during parade displaying the women empowerment in India. 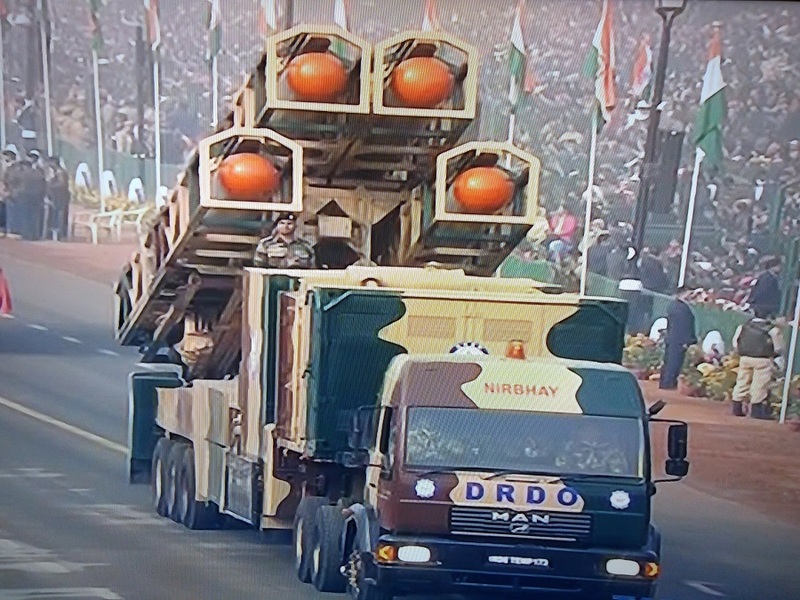 Displaying ‘Brahmos’ (two-stage missile with a solid propellant booster engine and short range ramjet supersonic cruise missile can be launched submarines, aircraft, ships, or land) and ‘Pinaka-MBRL’ (multibarrel rocket launch developed by DRDO) during R-day parade. Beating Retreat ceremony is a ritual performed later to the republic day celebration. It officially denotes the end of festivities after 26 January. It is generally held on the eve of 29th January means on third day after the event celebration. Government buildings look dazzling as they get decorated with lights from 26th to 29th January. 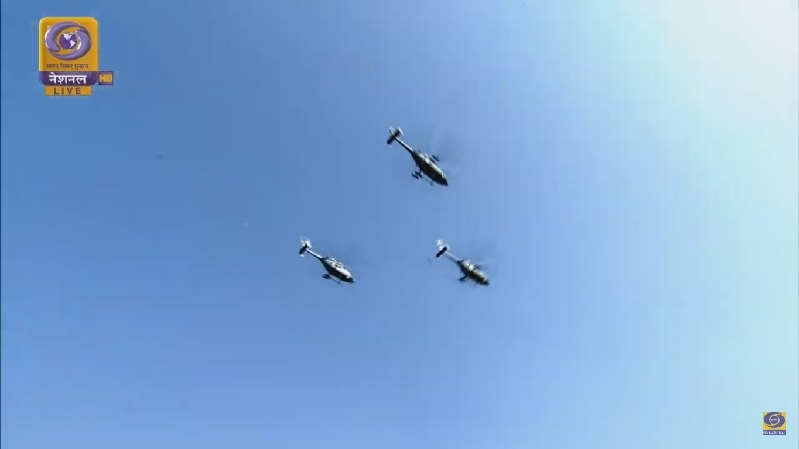 Beating the retreat ceremony is performed by the group of all the three wings of Indian military (Army, Navy and Air Force). It is performed at the Vijay Chowk (Victory Square), Rajpath and marks the end of 4 days long celebration of republic day in India. 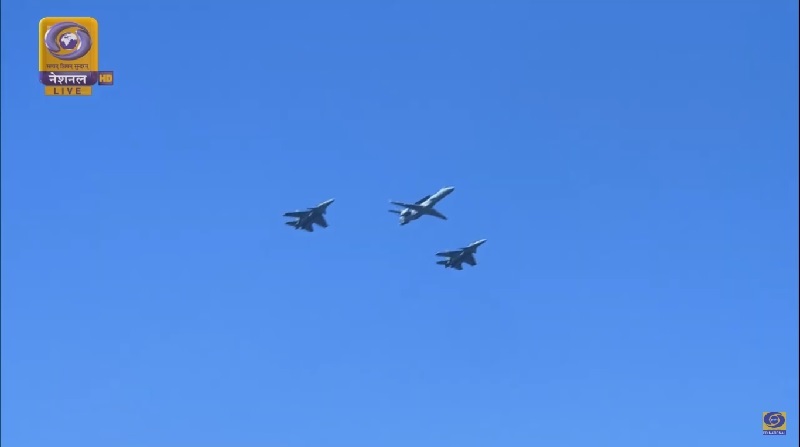 It is an event of national pride performed to mark the centuries old military tradition. It is carried out annually since 1950. It starts with the flag hoisting ceremony followed by the parade and display of rich cultural heritage and military power of India. President of India becomes the Chief Guest of this ceremony who arrives to the venue with a cavalry unit (soldiers who fight on horseback). This unit gives a National Salute on the order of PBG commander (President’s Bodyguards) when President arrives. At 6 pm in the evening, the National Flag is lowered when a bugler (a brass instrument like a small trumpet) sounds the retreat (means a signal for a military withdrawal). 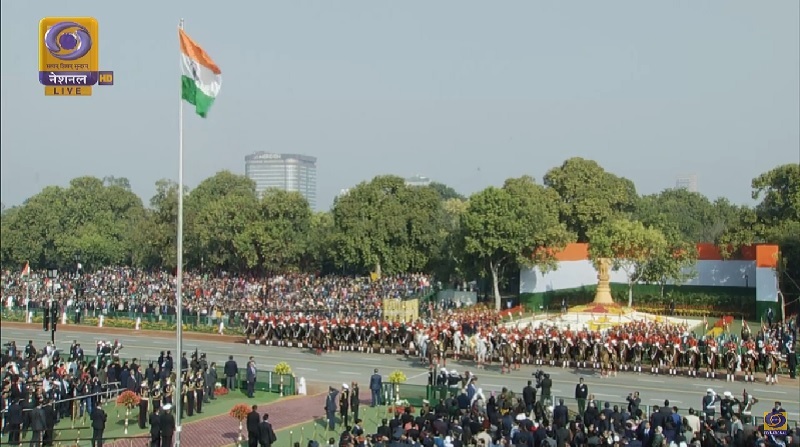 Then Indian National Anthem (Jana Gana Mana) is played by the Army (military bands, pipe, drum bands, buglers and trumpeters, bands of Navy and Air Force, etc) for the formal end. 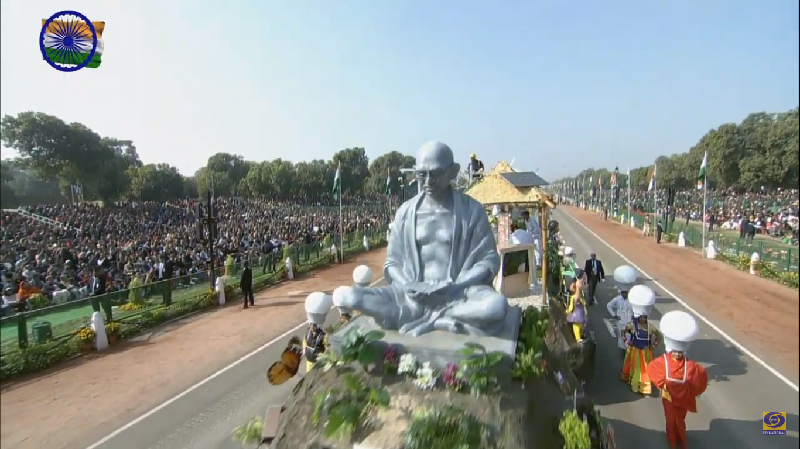 Later, some popular tunes (like Abide With Me, Mahatma Gandhi’s favorite hymn, Saare Jahan Se Achcha, etc) are also played at the end of ceremony.